Not to be confused with Battle of Raqqa (2017), Northern Raqqa offensive (May 2016), or Ithriyah-Raqqa offensive (June 2016). The Raqqa campaign (codenamed Operation Wrath of Euphrates) was a military operation launched by the Syrian Democratic Forces (SDF) against the Islamic State of Iraq and the Levant (ISIL) in the Raqqa Governorate, with the goal of isolating and eventually capturing the Islamic State's capital city, Raqqa. The SDF also completed their other main goals and captured the Tabqa Dam, the nearby city of al-Thawrah, and the Baath Dam further downstream. The offensive was concurrent with the Battle of al-Bab in the Aleppo Governorate, the Battle of Mosul, the Battle of Sirte (2016) in Libya, the Palmyra offensive (2017), the Central Syria campaign, the 2017 Mayadin offensive, and a reignition of fighting in Deir ez-Zor's siege. In late October 2016, the United States Secretary of Defense Ash Carter called for an offensive on Raqqa to take place concurrent with the Battle of Mosul in Iraq. He stated that the US was cooperating with its allies in order to launch an "isolation operation" around Raqqa. On 26 October, the President of Turkey Recep Tayyip Erdoğan called the President of the United States Barack Obama and stated that he did not want the People's Protection Units (YPG) to participate in the planned operation, and instead, planned to involve the Turkish Armed Forces. The United Kingdom's Secretary of State for Defence Michael Fallon rejected the idea of non-Arab forces taking part in the offensive and demanded a purely Arab force. On the same day, the commander of the Combined Joint Task Force – Operation Inherent Resolve Lt. Gen. Stephen J. Townsend stressed that the YPG-led Syrian Democratic Forces was the only armed group capable of capturing Raqqa in the near future. Fewer US-led coalition troops were to be involved than in the Battle of Mosul. On 3 November, the commander of the Seljuk Brigade and SDF spokesman Col. Talal Silo rejected the participation of Turkey in the operation. After the start of the Battle of Mosul (2016–17) in Iraq, many of the 20,000 ISIL fighters estimated to be living in the city fled to Raqqa, boosting the ISIL forces that were already present in their de facto capital city. The SDF officially announced the start of the operation on 6 November 2016, in the city of Ayn Issa. The intention was to proceed in two phases, first seizing areas around Raqqa and isolating the city, advancing from three fronts, then taking control of the city itself. The SDF general command called for the international coalition against ISIL to support the operation. Secretary of Defense Ash Carter welcomed the announcement. On 6 November, the SDF captured six small villages, including the villages of Wahid, Umm Safa, Wasita, Haran, al-Adriyah and Jurah south and southeast of Ayn Issa. The Islamic State detonated four car bombs on the first day of the offensive. On 8 November, the SDF reported that they had taken control of 11 villages near Ayn Issa. The SDF also claimed that ISIL used several car bombs against their forces. By 11 November, the SDF had captured over a dozen villages and the strategically significant town of Al-Hisbah, which had served as a local headquarters and command center for ISIL. On the next day, the SDF continued to advance against ISIL in the area around Tal Saman and Khnez, bringing the number of captured farms and villages to 26. On 14 November, the SDF reported the completion of the First Phase of the operations, stating that 500 km2 has been captured: 34 villages, 31 hamlets and seven strategic hills, along with 167 Islamic State casualties. The SDF had also begun to besiege Tal Saman, the largest village and ISIL headquarters north of Raqqa, while ISIL launched a counter-attack near Salok in the eastern countryside of Raqqa Governorate in order to force the SDF to split its forces and open a new front. On the next day, the SDF advanced into Tal Saman, resulting in a fierce battle with its ISIL defenders, and captured 10 more villages and farms. By 19 November, the SDF had fully captured Tal Saman and had driven ISIL completely from the surrounding countryside. With this, the first phase of the offensive was considered completed. The second phase of the offensive aimed to enforce a full blockade of the city of Raqqa. On 21 November, the SDF captured two more villages, while ISIL launched a counter-attack near Tal Saman. Over the next days, the SDF attempted to further advance, such as at al-Qalita, but was unable to break through ISIL's defense line south of Tal Saman. On 24 November, a US serviceman died from wounds he suffered after stepping on an improvised explosive device near the town of Ayn Issa, to the north of Raqqa. On 25 November, ISIL received reinforcements from Iraq, among them explosive experts and defected Iraqi Army personnel. On the next day, ISIL launched a counter-attack, retaking parts of Qaltah village and a nearby water pump station, while the SDF managed to advance in the village's vicinity. Boubaker Al-Hakim, an ISIL commander who was linked to the Charlie Hebdo shooting, was reported to have been killed in an American airstrike in Raqqa on 26 November. Iraqi military however later stated in April 2017 that he might still be alive. On 27 November, the SDF announced the offensive's second phase was due to start, though this was then delayed. At least five SDF fighters were killed in renewed clashes north of Raqqa on 29 November. Meanwhile, ISIL suffered from the defection of two senior commanders, who fled from Raqqa to join Jabhat Fateh al-Sham in Idlib. On 4 December, a coalition drone strike in Raqqa killed two ISIL leaders who had helped facilitate the November 2015 Paris attacks and another who was involved in a foiled suicide attack in Belgium in 2015. Three days later, co-Chair of the Democratic Union Party (PYD) Salih Muslim said that the first phase to surround Raqqa was almost over, while a new Arab brigade consisting of more than 1,000 men and women from the Raqqa area had joined the SDF as part of the second phase which was slated to be launched on 10 December. More than 1,500 Arab fighters who were trained and equipped by the anti-ISIL coalition joined the SDF for the second phase on its launch day. SDF fighters advance northwest of Raqqa after the start of the offensive's second phase. The SDF launched the second phase on 10 December, with the aim of capturing the northwestern and western countryside of Raqqa and ultimately reaching and securing the Tabqa Dam. The same day, it was announced that Arab SDF groups, consisting of the Elite Forces, Jabhat Thuwar al-Raqqa and the newly formed Deir Ezzor Military Council would be taking part. During the first day, the SDF began to advance south of the Tishrin Dam and captured al-Kiradi village. The United States announced that it would send 200 more troops to assist the SDF. The next day, the SDF captured seven more villages from ISIL. On 12 December, the SDF captured four villages as well as many hamlets south of Tishrin Dam. The SDF captured five villages during the next two days. On 15 December, the SDF captured three villages, taking the total number of villages captured by them in the second phase to 20. Over the next four days, the SDF captured 20 more villages and finally reaching Lake Assad, thereby cutting off and besieging 54 ISIL-held villages to the west. In response to these territorial losses, ISIL began to carry out more suicide attacks against both the SDF as well as civilian targets within SDF-controlled areas in an attempt to hinder the offensive. On 19 December, ISIL launched a counter-attack to regain four villages in the northwestern countryside, but the attack was repelled after a few hours. The following night, ISIL forces retreated largely unopposed from the besieged 54 villages, leaving them to be captured by the SDF. The SDF declared that they had captured 97 villages overall during the second phase, and had begun to advance against Qal'at Ja'bar. On 21 December, the SDF seized five villages near Qal'at Ja'bar, including Jabar, which served as the main weaponry storage and supply centre for ISIL in the northwestern countryside. The coalition then began to move toward Suwaydiya Saghirah and Suwaydiya Kabir, the last villages before Tabqa Dam. Even though an ISIL counter-attack managed to retake Jabar village soon after, the SDF attacked again on 23 December, and once again took control of it, while also capturing another village. This prompted ISIL to launch yet another counter-attack later that day, which was accompanied by several suicide car bombs. As a result, heavy clashes took place between them and SDF fighters in several villages along the frontline that lasted until the early morning of 24 December. The ISIL forces were eventually forced to withdraw after the SDF first shelled and then stormed their positions, whereupon the latter took control of most of Jabar as well as two more villages, though some ISIL holdouts persisted in Jabar. ISIL was pushed out of the neighboring, strategic village of Eastern Jabar on the next day, bringing the SDF within 5 kilometres (3.1 mi) of Tabqa Dam, and by 26 December, the SDF had finally fully secured the main Jabar village, with the last ISIL defenders being expelled after heavy fighting. An ISIL counterattack on the village later that day failed, with a US airstrike killing Abu Jandal al-Kuwaiti as he commanded the assault. Al-Kuwaiti, also known as Abdulmuhsin al-Zaghelan al-Tarish, was a high-ranking ISIL commander leading the defense of the whole Raqqa region against the SDF. Meanwhile, the Amaq News Agency declared that Iman Na'im Tandil (nom de guerre: Abu 'Umar Al-Hindi), one of the few Indian ISIL fighters active in Syria, had also been killed during the fighting near Jabar. The Islamic State's official media wing later also officially paid tribute to Iman. On 27 December, ISIL launched an attack on the village of Secol in the northern countryside, reportedly breaching the local SDF defences. On the next day, the SDF reportedly captured Hadaj village after two days of heavy fighting, while another ISIL counter-attack against Jabar was repelled. Mahmud al-Isawi, a senior ISIL manager of finances for the group's leaders who also worked in propaganda and intelligence-gathering, was killed on 31 December in a US-led coalition airstrike on Raqqa. After three days of heavy fighting, the SDF captured all or most of Mahmudli, the largest town of the Al-Jarniyah Subdistrict, on 1 January 2017. ISIL counterattacked later in an attempt to regain the town. The SDF leadership said that in the clashes since the launch of the second phase they had captured 110 villages, killed 277 ISIL fighters, and captured 13. Also, on January 1, 2017, the SDF resumed its offensive on the northern front, advancing 6 km south of Tell Saman against ISIL positions. The SDF captured nine more villages in this area within the next three days. Meanwhile, with the SDF edging closer to Raqqa, ISIL further restricted Internet access and increased surveillance over Internet users in Raqqa. There were harsh punishments for accessing anti-ISIL websites, with a new special unit within the ISIL's security office searching for offenders. Several online activists in Raqqa were captured and tortured or executed. Another two villages and hamlets were captured by the SDF on 5 January 2017. SDF fighters examine Qal'at Ja'bar. ISIL had built tunnels and weapons depots into the medieval castle. The SDF captured Qal'at Ja'bar (Ja'bar Castle) from ISIL on 6 January. The same day, ISIL was reported to have moved its 150 prisoners from Tabqa city due to the offensive. The SDF later captured eight villages and five hamlets at the Ayn Issa front. On 7 January, the SDF captured five villages including the strategic Suwaydiya Gharbi and Suwaydiya Saghirah, reaching the outskirts of Tabqa Dam. ISIL recaptured Suwaydiya Saghirah by the next day after a counterattack, while a local leader of the group was killed in clashes. Meanwhile, ISIL was reported to have withdrawn 150 of its fighters towards Raqqa city. On 8 January 2017, US special forces raided the village of Al-Kubar, between Raqqa and Deir ez-Zor, killing at least 25 ISIL militants in the two-hour operation. It was believed that the goal of the US may have been to rescue hostages from an ISIL secret prison in the village. After the raid, ISIL forces cut off access to the village. On 9 January, the SDF captured another village, along with three hamlets. On 10 January, ISIL launched a large-scale counter-attack at the Jabar frontline and reportedly recaptured several sites; with pro-Free Syrian Army sources claiming Qal'at Ja'bar and the village of Jabar were among these. ISIL consequently released photos of dead SDF fighters, while claiming that over 70 of them had been killed in the counter-attack. However, the SDF was reported to still be in control of Jabar village and Qalat Jabar a few days later. An ISIL attack on Jib Shair village, trying to resist SDF advances from the north, was repelled on the next day, after which the SDF advanced and captured six hamlets around it. The SDF later announced that their forces advancing from the Ayn Issa front and on the Qadiriya front linked up in Kurmanju village after capturing several villages over the past few days, besieging a large pocket of about 45 villages and 20 hamlets. All of them were captured by the next day, resulting in the alliance gaining about 460 square kilometres (180 sq mi) of land. Another village was captured by the SDF on 13 January. On 15 January, the SDF progressed to Suwaydiya Kabir village, while ISIL launched a large-scale counter-attack against Mahmudli and a nearby village, resulting in clashes within these settlements. The attack was repelled after several hours of fighting. The SDF captured three villages during the day, while Suwaydiya Saghirah was also reported to be under its control again. On 17 January 2017, 28 Arab tribes from Raqqa announced their support for the offensive and encouraged locals to join the SDF. The SDF attacked Suwaydiya Kabir on the next day, leading to heavy clashes in the village. Meanwhile, it was announced that about 2,500 local fighters had joined the offensive since it began. On 19 January, ISIL launched a counter-attack against Suwaydiya Saghirah, supported by mortars and heavy machine guns, killing or wounding several YPG fighters. Despite this, the SDF made further progress on the next day, capturing a village and advancing against many other ISIL-held villages. The SDF again attacked Suwaydiya Kabir on 20 January, reaching the outskirts of the village, and captured it on 22 January after heavy clashes, with the support of U.S. special forces. In late January 2017, it was reported that a number of ISIL militants were hiding inside the structure of the Tabqa Dam, including senior militant leaders who used to be "very important prisoners" wanted by the US and several other countries, in order to deter a possible US-led coalition strike on them. On 23 January, the SDF began to advance on the Tabqa Dam, spurring ISIL to open its turbines to raise the Euphrates River's water levels. This was seen as an attempt to hinder the progress of the Kurdish-led forces and a scare tactic, and caused the water level of the Euphrates to rise to its highest level in 20 years, leading to record flooding downstream. Coinciding with this, pro-SDF sources reported that US special forces and SDF units had launched a raid against Al-Thawrah across the river. By 24 January, the SDF managed to capture parts of the town, and they began to work towards the Tabqa Dam's control rooms, at the southern part of the dam, in an attempt to stop the massive outflow of water released by ISIL. However, the entrance to the dam's control rooms was too well defended, and with the continued threat of disastrous flooding downstream, SDF and the US forces withdrew from both the Tabqa Dam and the town of Al-Thawrah, after which ISIL closed the dam's turbines again. Over the next three days, ISIL repeatedly launched fierce counter-attacks against SDF positions in the western and northern countryside. ISIL managed to retake ground in the area around the dam, but the attack was later repelled. On 31 January 2017, the SDF received a number of armoured personnel carriers supplied by the US. The SDF spokesman stated that preparations for a new phase of the operation were continuing and the operation would begin in "a few days". Meanwhile, the leader of the SDF-aligned Syria's Tomorrow Movement and its paramilitary wing, Ahmad Jarba, announced that 3,000 Arab fighters under his command were training with US special forces to be deployed in the battle for Raqqa against ISIL. On the night of 2–3 February, intense CJTF–OIR airstrikes targeted several bridges in or near Raqqa city, destroying them as well as the local water pipelines, leaving the city without drinking water. Meanwhile, the SDF advanced against the village of Qaltah in the northern countryside, which the coalition had already unsuccessfully attacked in November. ISIL maintenance crews managed to fix the pipelines during 3 February, restoring Raqqa's water supply. On 3 February, 251 Arab fighters in Hasaka completed their training and joined the SDF. On 4 February, the SDF announced the offensive's third phase, aiming at capturing Raqqa's eastern countryside, and to separate Raqqa city from ISIL forces in Deir ez-Zor, though operations in the west and north would continue simultaneously. The SDF captured a village and three hamlets to the northeast of Raqqa later that day, with clashes being reported at al-Qaltah and Bir Said.. On the next day, the Kurdish-led forces captured another two villages along with a hamlet and two farms, and besieged Bir Said, while especially intense airstrikes hit several ISIL targets in Al-Thawrah. Bir Said, along with another village, was eventually captured by the SDF on 6 February. In addition to these villages, the SDF also captured another five villages on two fronts. The SDF made further progress, capturing three more villages on 7 February. In early February 2017, US-led coalition airstrikes destroyed much of the Deir ez-Zor-Raqqa highway, reducing it to a single-file gravel road in some spots, with the SDF patrolling other areas with minefields, in order to prevent ISIL from reinforcing Raqqa city. By this point, almost all of the five bridges leading to Raqqa had been destroyed either by the US-led coalition or by ISIL, with the only exceptions being the Tabqa Dam and the Baath Dam, both west of Raqqa city. As these advances continued, ISIL responded by launching several unsuccessful counter-attacks against Suwaydiya Kabir and other strategic territories captured by the SDF. On 8 and 9 February, the SDF advanced at the northern and northeastern frontline, capturing several villages and besieging Mizella, a major strategic ISIL stronghold in the northern countryside. The advance put them within 11 kilometres (6.8 mi) of Raqqa. The SDF captured Mizella the next day. The two fronts of the alliance converged on 11 February as it also captured two villages and wheat silos to the north of Raqqa during the day; the next day, the SDF attempted to cross the Balikh River northeast of Raqqa, leading to heavy fighting with local ISIL defenders. On 12 February, a large-scale counter-attack by ISIL reportedly succeeded in retaking Suwaydiya Kabir and four other nearby villages. However, pro-YPG sources denied these reports. Another counterattack was carried out by ISIL to the northeast of Raqqa where the SDF had advanced to, leading to heavy clashes between both sides. Clashes continued over the next few days. A destroyed bridge over the Euphrates in Deir ez-Zor Governorate. As a result of the CJTF–OIR bombing campaign, as well as ISIL detonations, most bridges across the river were destroyed. On 17 February 2017, the SDF announced the launch of the second stage of the third phase, aimed at capturing the eastern countryside of Raqqa near Deir ez-Zor, with the Deir Ezzor Military Council leading the operation. On the same day the SDF captured two villages from ISIL to the north of Deir ez-Zor and came within 6 kilometres (3.7 mi) of the northeast of Raqqa, while the Russian Air Force conducted airstrikes on ISIL forces in Raqqa city for the second time since its entry into the war. The next day, the SDF captured another village to the southwest of the Makman front (north of Deir ez-Zor) as well as another near Raqqa. On 18 February, the SDF stormed a prison a few kilometres northeast of Raqqa, freeing some of the inmates. They later captured three villages in Deir ez-Zor's northern countryside. On the next day, the SDF captured five villages to the east of Raqqa. On 20 February, they captured four villages on the Makmen front, including the strategic village of Sebah al-Xêr as well as a base station of Syriatel, thus cutting off the road between Makman and Raqqa and besieging three ISIL-held villages. Furthermore, the SDF took control of a significant bridge over the Balikh River on the western front. On 21 February, the SDF captured two villages on the Makman front and another one near Raqqa. ISIL later again assaulted Suwaydiya Kabir, attacking it from three fronts, leading to heavy fighting around it. The SDF continued advancing in the eastern countryside of Raqqa on 22 February, capturing three villages, and merging the two fronts at Makman and Bir Hebe. A YPJ commander declared that the SDF had cut the road to Raqqa and Deir ez-Zor. The SDF stated that it had entered Deir ez-Zor Governorate for the first time in the offensive. On the next day, they captured six villages and sixteen hamlets. On 24 February, the SDF captured four villages in the Makman front and another three in a fourth front to the northeast of Deir ez-Zor. They captured the strategic Abu Khashab village later that day. On 25 February, they captured another three villages on the fourth front. On 26 February, a US airstrike near Tabqa Dam destroyed a former government facility which was being used as a headquarters by ISIL. The airstrike's proximity to the dam's structure led to fears that the dam could potentially be destabilized or destroyed during the fighting. Later that day, it was reported that the SDF had captured the village of Al-Kubar, on the northern bank of the Euphrates in the Deir ez-Zor countryside, further tightening the siege on Raqqa. On 28 February, it was reported that the US-led coalition had completely destroyed the Tabqa Airbase in an airstrike. On 27 February, the plan that the Pentagon submitted to US President Donald Trump to significantly speed up the fight against ISIL included a significant increase in US participation in the Raqqa campaign, with the possibility of the US increasing its ground presence on the Raqqa front to 4,000–5,000 troops. The offensive resumed on 5 March, with the SDF capturing at least seven villages and 15 hamlets to the northeast of the Euphrates River, east of Raqqa. The offensive had previously been paused due to bad weather, according to the SDF. The area captured by the SDF on that day was about 19 square kilometers, and about 32 ISIL militants were killed in the clashes. After further advances on 6 March, the SDF cut the highway between Raqqa and Deir ez-Zor, which was the last road out of the city, and reached the Euphrates River. The SDF captured six villages, the Al-Kubar Military Base (a former nuclear facility), and the Zalabiye Bridge, during the day. On 8 March, the SDF took control of the strategic West Menxer hill in the eastern countryside, while elements of the US 11th Marine Expeditionary Unit were deployed to northern Syria, bringing with them an artillery battery of M777 howitzers to support the attack on Raqqa. Meanwhile, about 150 ISIL militants from Hama and Deir ez-Zor managed to reinforce Raqqa, by crossing the Euphrates, despite the partial siege that had been imposed by the SDF on the city. On 9 March, SDF captured the strategic East Menxer hill and captured three villages on two different fronts. Two villages, including Kubar, were captured on the front to the far east of Raqqa, and one near Raqqa. 244 Arab fighters from the Raqqa countryside also joined the SDF during the day, for the protection of the people in the region. On the next day, the SDF advancing from the Abu Khashab front captured three villages, including two near Kubar. On 12 March, the SDF captured Khas Ujayl village, to the southeast of Raqqa, on the Abu Khashab front, while ISIL continued to launch repeated counterattacks in the area, in an attempt to check the SDF advances. Meanwhile, 230 ISIL fighters entered Raqqa to reinforce the city. On 14 March, the SDF captured the Khass Hibal village, as well as the Al-Kulayb grain silos, along the Raqqa-Deir Ezzor highway. An SDF spokeswoman stated that Raqqa had been isolated. The advance of the SDF put them in control of the land region used by ISIL to connect to their territories in the east, stretching from al-Kubar to the northern bank of the Euphrates and measuring 30 kilometres (19 mi). The SDF captured the Hamad Asaf silos and the Al Kulayb village the next day. Hamad Assaf was also reportedly captured. On 17 March, a YPG commander stated that the SDF planned to storm Raqqa city in April 2017, and that the YPG would be participating in the attack, despite the fierce opposition from the Turkish government. However, Pentagon Spokesman Jeff Davis denied that any decision had been made regarding when and how an assault on Raqqa city would be carried out. Meanwhile, clashes continued to take place around Khas Ujayl. Heavy clashes took place in the town of al-Karama, to the east of Raqqa, on 19 March. On the next day, SDF captured al-Karama, along with Jarqa village as well as a train station and water pumping station nearby. On 21 March, it was reported again that the SDF had captured Hamad Assaf in the eastern countryside from the Abu Khashab front. Another village was captured on 22 March from the Abu Khashab front. Meanwhile, Syrian Observatory for Human Rights (SOHR) and Raqqa is Being Slaughtered Silently (RIBSS) stated that coalition airstrikes hit a school being used as a shelter for displaced people in a village to the west of Raqqa on 20 March. SOHR stated that 33 civilians were killed in the airstrikes while RIBSS stated that it was unknown what happened to 50 families who were there. The SDF continued advancing in the eastern Raqqa countryside on 23 March, capturing two more villages on the Abu Khashab front, allowing them to capture a small ISIL pocket. On 24 March, the SDF took control of two more villages in the eastern countryside of Raqqa. On 22 March, the SDF began an assault to capture the Tabqa Dam, al-Thawrah (Tabqa) city, and its airbase. Five hundred SDF fighters and five hundred US Special Forces from CJTF–OIR were airlifted by helicopters of the United States military, across the Euphrates River and Lake Assad, and were dropped on the Shurfa Peninsula to the west of Al-Thawrah. The attack was supported by artillery support from United States Marines, as well as air support. SDF and US forces also landed on the Jazirat al-'Ayd Island (or Peninsula) to the west of Tabqa Dam, capturing it as well. Four villages southwest of Tabqa were captured in the attack, including Abu Hurayrah, al-Mushayirafah, al-Krain, and al-Jameen. The SDF advanced towards the town of Al-Thawrah, where fliers were dropped, asking residents to stay indoors and avoid clashing against ISIL for now. These fliers were also dropped on Raqqa city. An anti-ISIL coalition spokesman announced that the advance had cut off the highway linking the Aleppo, Deir ez-Zor, and Raqqa Governorates. He added that around 75-80% of the attacking force consisted of Arab fighters, with the rest being Kurds. The SDF stated that the advance was also meant to block any advance on Raqqa by the Syrian Arab Army from the west. On the same day, SDF and US forces stormed the Tabqa Dam, triggering "intense" clashes with ISIL forces. US officials stated that it may take several weeks to capture Tabqa Dam, Al-Thawrah city, and the surrounding countryside from ISIL. Airstrikes by the coalition on Tabqa city were reported to have killed about 25 civilians. On 23 March, some early reports circulated that the SDF had captured Tabqa Dam from ISIL, after clashing with ISIL forces for a few hours. However, these reports were unconfirmed by other sources, with neither the SDF or CENTCOM confirming the capture of Tabqa Dam, and Rudaw reported that the SDF was still preparing to capture it. SDF spokesman Talal Silo stated during the day that they were still advancing on the dam and the city and expected to attack the dam soon. Later on the same day, it was reported that ISIL was redeploying a large number of fighters from the Deir ez-Zor Province to Al-Thawrah and Raqqa city, in order to reinforce those fronts. ISIL's Amaq News Agency later denied later that the SDF had captured the dam. On 24 March, SDF spokeswoman Jihan Sheikh Ahmed announced that they had reached the Tabqa Dam, and were fighting ISIL at its entrance. The assault on the dam was spearheaded by SDF fighters who were backed by United States Special Operation Forces. According to early reports, the SDF and its allies had taken its outer perimeter, with the battle ongoing for its middle. On the same day, it was also reported that the SDF had captured 8 villages to the southwest of Al-Thawrah. On the same day, the SDF advanced on Al-Tabqa Airbase, setting off clashes in the vicinity. Amaq meanwhile claimed SDF had withdrawn from the dam. On 26 March, the SDF captured 2 villages to the east of Al-Thawrah. It was also reported that ISIL was shelling the surroundings of Tabqa Dam with heavy weaponry. On the same day, ISIL claimed that Tabqa Dam was on the verge of collapse and that all the floodgates were closed. The dam was reported to have become inoperable, which ISIL claimed was due to Coalition bombing and artillery strikes, though the SOHR stated that the actual reasons were unknown, adding that ISIL still held its main building and turbines. SDF however denied that it had been hit, while RIBSS (Raqqa is Silently Being Slaughtered) stated that ISIL was informing fleeing civilians that the dam was safe. Additionally, the US-led Coalition stated that the Tabqa Dam was structurally sound, and that the dam had not been targeted by any airstrikes. They also stated that the SDF controlled an emergency spillway at the northern part of the dam, which could be used in the event of an emergency. On the same day, SDF spokesman Talal Silo announced that SDF had stormed the Tabqa military airport, and had taken sixty to seventy percent of it. They later announced that they had completely captured the Al-Tabqa Airbase, following a 24-hour battle. ISIL forces stationed at Al-Tabqa Airbase were reported to have withdrawn northward, to Al-Thawrah city. Additionally, the SDF captured 2 villages near the airbase during the advance. Late on 26 March, it was reported that the SDF had taken full control of Tabqa Dam, and that repairs on the dam by Coalition engineers had begun. A day later however SDF announced they were temporarily pausing their offensive for the dam. Later in the day, a spokeswoman of the SDF announced that engineers who had been permitted to check the dam and its operations did not find it was damaged or malfunctioning. SDF also captured 2 villages to the west of Raqqa on the same day. It resumed the offensive against ISIL at the Tabqa Dam on 28 March. Syrian engineers worked on the dam during a pause in the fighting to open spillways and ease the pressure on the dam. Its southern reaches were reported to be under ISIL control. ISIL claimed that the maintenance team was killed in airstrikes by the anti-ISIL coalition while the SOHR stated that it had learned that the engineer administering the dam had been killed in airstrikes along with a technician. It also stated that the group had sent 900 fighters from Raqqa to fight against the SDF advance. On 29 March, the SDF cut the road between Al-Thawrah (Tabqa) city and Raqqa. The SDF stated that ISIL had shelled the Tabqa Dam during the day, causing repair work to be temporarily paused. On 31 March, the SDF attacked the town of al-Safsafah, to the east of al-Thawrah, in an attempt to besiege the city. On the same day, the Ajeel tribe of Raqqa announced its support for the SDF's Raqqa campaign and sent 150 fighters. The SDF announced during the day that over 220 new recruits had joined the offensive. Meanwhile, leaflets were dropped on the city calling on ISIL to surrender. Clashes continued in the countryside of Tabqa on next day as both sides attempted to advance. The SDF and some activists stated on 2 April that it had repelled a major ISIL counterattack to the northeast of Tabqa city, near the Tabqa Dam and near the Tabqa airbase. They also continued to advance in villages to the east of Tabqa city. On the same day, it was reported that SDF had completely besieged Al-Thawrah (Tabqa) city, with Kurdish activists stating that 2 SDF units linked up to the east of the city. SOHR, however, stated that they were still trying to besiege the city. SDF fighters continued battling for Safsafah and Ibad, on the next day, to fully encircle Tabqa. On 3 April, it was reported that ISIL was possibly in the process of moving its capital from Raqqa city to Mayadin, in the Deir ez-Zor Governorate. This followed months of gradual relocation of resources and senior ISIL leaders from Raqqa to Mayadin. SDF entered and besieged Safsafah on 5 April, thus also besieging Tabqa city while claiming that it had also taken control of a major part of Safsafah. The village was captured by the next day, resulting in SDF completely encircling Tabqa city. On 6 April 2017, US Special Forces carried out a raid near the city of Mayadin, in the Deir ez-Zor Governorate, killing Abdul Rahman al-Uzbeki, a high-ranking ISIL commander who was believed to have masterminded the 2017 Istanbul New Year terror attack. On 11 April, the US-led Coalition reported that the SDF had captured 60% of Tabqa Dam, and that they were "very close" to liberating the dam. On 13 April, the United States military stated that CJTF–OIR had bombed a SDF fighting position near Tabqa as it was misidentified as belonging to ISIL. It added that the airstrikes resulted in deaths of 18 SDF fighters. On 13 April, the SDF announced the launch of the fourth phase of the campaign. The new phase would involve capturing the entire area directly north of Raqqa city, including the Jalab valley, as well as further strengthening the siege of Raqqa city. The advancements may involve capturing the southern countryside of Raqqa as well, since the SDF stated that they plan to fully isolate the city before launching an attack on it. A plan to attack Raqqa city itself was also scheduled to for April 2017, but it was postponed due to the Battle of Tabqa. SDF was reported to have captured a village in the northern countryside of Raqqa on the same day. SOHR stated early on 15 April that the SDF had advanced to the edge of Tabqa, and was within hundreds of meters of the city. Later, SDF captured the village of Ayad al-Saghir near Tabqa and stormed the city itself, capturing the Alexandria suburb and bringing about 15% of the city under their control. They also cleared the Mushayrifah village near Tabqa, killing 27 ISIL fighters. On 17 April, the SDF captured three villages in the northern countryside of Raqqa, and four hamlets. On the same day, the Manbij Military Council announced that 200 of its fighters would participate in the battle for Tabqa, with a total of 350. SDF advanced in Tabqa city again on 17 and 18 April, also capturing an ISIL radio station. On 19 April, SDF captured 4 villages near Raqqa as well as other areas. On 20 April, they captured at least six villages to north of Raqqa. More villages and areas were captured by the SDF north of Raqqa on 21 and 22 April, including Hazima and Mazrat Tishrin. Meanwhile, it was reported that ISIL had essentially moved its capital to Mayadin, in the Deir ez-Zor Governorate, and that ISIL had centered its forces in the Deir ez-Zor Governorate, thus transforming Mayadin into a "secondary capital city" for ISIL. On 24 April, the SDF captured the ISIL pocket to the north of Raqqa city, allowing them to gain control of 13 villages. By 25 April, the SDF captured the Wahab district of Tabqa city, during a large advance in its southern and western flanks, which increased SDF control of the city to 40%. The SDF also destroyed an ISIL cell in Jazirat al-Ayd, allowing them to completely secure the island. Meanwhile, the two SDF fronts north of Raqqa were reported to have joined up, following the capture of a number of villages in a former ISIL pocket. The SDF also announced that it had captured the northern part of Julab Valley. They announced on 28 April that they had captured the Nababila and Zahra districts of Tabqa city. Meanwhile, the YPG also threatened to withdraw from the operation to capture Raqqa, if the United States didn't take measures to stop Turkey's attacks against the group. A SDF fighter stands in a destroyed area of Tabqa city. SDF advanced in Tabqa city again on 30 April. They stated that they had captured six more districts, and that ISIL only controlled the northern part of the city near Tabqa Dam. SOHR stated that SDF controlled at least 40% of the city, including more than half of the Old City area. Later on the same day, it was reported that the SDF had captured at least 60% of the city. On the next day SDF stated that it had completely captured the Old City area, leaving ISIL in control of only the newer areas of the town alongside the dam. SOHR stated that they controlled about 80% of the city. 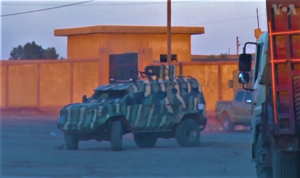 On 2 May SDF stated that it had captured about 90 percent of the town amid reports of negotiations between Kurdish fighters and ISIL to allow the latter to withdraw from the remaining areas under its control. By 3 May, SDF had almost captured the whole city except a small northern area and district near the dam. ISIL also carried out counterattacks in and near Tabqa. It was later reported that a deal had been reached to allow remaining ISIL fighters to withdraw from the city as well as the dam. SDF and its commanders however denied any deal had been reached, adding that clashes were still ongoing against ISIL in a village near Tabqa and the three northern districts of the town including some militants who were hiding among civilians. Also on 3 May, a new batch of 110 fighters of the Elite Forces graduated after training in Al-Hasakah. The fighters are scheduled to participate in the Raqqa campaign. On 8 May 2017, 100 Arab fighters from northern Raqqa started training to join the YPG, for the Raqqa offensive, with training set to conclude at the end of the month. Also on 8 May, SDF announced that they had captured the First Quarter district of Tabqa city that connects the three newer districts of the town to the dam. The advance cutoff the two remaining suburbs under ISIL control from the dam. In addition, SDF also captured the Watani hospital. It was also reported that SDF had captured the village of Sahel al-Khashab. SOHR reported that although some Syrian ISIL fighters had withdrawn under a deal allowing SDF to take control of the whole town, other fighters who were mostly non-Syrian refused to withdraw and were clashing with SDF as well as waging a guerilla-style battle. On 9 May, the SDF made a press statement announcing the relaunch of the fourth phase of the campaign after a 15-day suspension. The following day, the SDF as well as SOHR announced that the alliance had completely captured the town as well as the dam. The SDF announced that they had resumed the fourth phase of the campaign on 10 May. On the next day, it was reported that the SDF had captured two to three villages to the north of Raqqa city. Later, they captured another village north of Raqqa. An ISIL counter-attack on Tabqa city was meanwhile repelled. On 12 May, 2 villages in the northern countryside along with a cotton mill were captured. Kurdish news agencies also stated that SDF had captured a local ruling party headquarters as well as prison used by the militants. By 14 May, SDF captured three to four villages to the north of Raqqa. About seven to eight villages were captured by SDF in the region till 17 May, along with about 17 hamlets also reported captured. On 18 May, SDF captured a village located to the east of Raqqa. On the next day, two villages along with a farm were captured by the alliance. By 21 May, two villages were captured with SDF advancing within 2 kilometres (1.2 mi) of the Baath Dam. By 23 May, another 2 villages were captured near the dam. Another village was captured near the dam later. On 24 May, two villages including the town of Hamrat Nasera were captured by the SDF in the western countryside while a village in the eastern countryside was also reported to have been captured. On the next day, the SDF captured the strategic Kadiran village to the north of the dam. Meanwhile, the Manbij Military Council sent an additional 2,200 fighters. The SDF stated the next day that more than 1,000 men from the al-Tabqa region had joined it on the day. Following the seizure of six villages on 30 May, the Kurdish-led Syrian Democratic Forces (SDF) continued on the 31st as units were able to take control of Hunaydi village and establish fire control over a section of the M6 highway, a jihadist supply road which runs vertically through ISIS territory in Syria. In addition, ISIL withdrew from the village of al-Assadiah. Effectively, the SDF had then besieged the highly fortified Division 17 military base, located directly north of the provincial capital. Meanwhile, approximately 4,000 ISIS fighters were waiting to fight the SDF in Raqqa. On 2 June, the SDF captured the town of Mansoura after a 3-day battle. Before the SDF captured it, Mansoura was the largest town still under ISIL control west of Raqqa. By 4 June, the SDF fully captured Baath Dam. The United States Marine Corps providing fire support for the SDF during the Battle of Raqqa. On 6 June 2017, the SDF announced the start of the Battle of Raqqa city. The offensive came from Raqqa's north, east, and west. The SDF attacked the 17th Division base and the Mashlab district in the northern part of the city. The battle was earlier announced by SDF to be the "fifth and final phase". On 24 June, the SDF completely besieged Raqqa city, trapping about 4,000 ISIL militants in the city. As of the 28 September, around 50% of Raqqa had been "totally destroyed" during the battle. On 14 October, a group of ISIL fighters and around 400 civilians, reportedly used as human shields by ISIS, evacuated from Raqqa under an agreement with the SDF. The next day, the SDF announced the "final phase" of the battle, code-named the Battle of Martyr Adnan Abu Amjad, to capture the remaining ISIL holdouts in 10% of the city. On 16 October, the SDF reportedly destroyed the last ISIL forces in the al-Andalus and al-Matar neighborhoods, and finally secured the al-Naim roundabout. On 17 October, ISIL control in Raqqa officially ended when the SDF captured the National Hospital and the Stadium, though a clear and hold operation was still expected in order to clear out potential remaining pockets of resistance. Following the end of clearing operations, victory was officially declared by the SDF on 20 October. On June 12, the Syrian Arab Army (SAA), led by the Tiger Forces, began an offensive on ISIL positions in the western countryside of Raqqa, south of the town of Maskanah, which it recently captured, toward the Ithriya-Tabqa highway, aiming to secure its main supply route to Aleppo. A Hezbollah-run media unit reported that government forces advanced 32 km south of Maskanah, capturing the villages of Rajm Askar, Bir Inbaj, Zahar Um Baj, Jab Aziz, Jab al-Ghanem, Abu Sousa and Jab Abyadin in the process. A source close to the Tiger Forces said that the SAA had occupied all areas west of the Resafa oil field. Al-Masdar News reported that the June 13 advances marked the first time government forces had any presence around SDF-occupied Tabqa in three years. On 18 June, a Syrian Air Force Su-22 was shot down by a US Navy F-18E south of Tabqa; the US military subsequently claimed that the Syrian jet had been intercepted after it had bombed SDF positions. Both the pro-opposition SOHR as well as the pro-SDF Hawar News Agency denied this, however, stating that the jet had not attacked the SDF. The Syrian government said that their Su-22 had bombed ISIL positions when it was destroyed. On July 15, the SAA captured the Wahab, al-Fahd, Dbaysan, al-Qseer, Abu al-Qatat and Abu Qatash oil fields, south of Resafa. Al-Masdar News reported that the Tiger Forces overran three more fields in the region the following day, including Zamleh Sharqiyah, Bir Zamleh and Al-Khalaa. On 14 November, the SDF's civilian sister institution, the Syrian Democratic Council (SDC), started working on the establishment of a civilian administration to run the city of Raqqa after the expulsion of the Islamic State of Iraq and the Levant. SDC co-chair Îlham Ehmed said "such an administration could provide a good example for democratic change in Raqqa, especially that the city has been for years a de facto capital for the ISIS terrorist group. This accomplishment would be a major change in the overall situation in Syria, and would help the country move towards stability, democratic change. Raqqa will be an example for the whole country." On 8 December, Col. John Dorrian, the Operation Inherent Resolve spokesman, stated that "a governance structure representative of the local population" similar to that in Manbij is planned for Raqqa. On 10 December, Cihan Shekh Ehmed, the spokesman of the SDF-led operation, said that Raqqa would be run by a local elected civilian council after it was liberated. On 27 March 2017, Salih Muslim Muhammad, co-chairman of the Democratic Union Party (PYD), said that as soon as the SDF had captured the city, "the people of Raqqa are the ones who [will] take the decision on everything". If they wanted to do so, Muslim said, they could choose to join the Democratic Federal System of Northern Syria. On the same day, the provisional Raqqa Civil Council announced that it had taken over the administration of the eastern countryside. During a meeting in Ayn Issa on 18 April 2017 attended by tribal chiefs and local dignitaries from Raqqa, SDF announced the official establishment of a civilian council to govern Raqqa city after it is captured. During the meeting of delegates including representatives from Arabs, Kurds and Turkmen; co-chairs Layla Mohammed and Mahmoud Shawakh al-Busran were elected and 14 committees were established. SDF stated that a military council to provide security to the city after its capture will be formed soon. On 20 April, the new civilian council also began to operate in the areas of Tabqa, handling the distribution of food to local villagers. On 15 May 2017, an agreement was made to establish a 'Tabqa Civilian Assembly'. This assembly will be temporary as a broader assembly will be established with councils following the return of residents. On 17 May 2017, the Raqqa Internal Security Forces (RISF) were established as new police unit, with the first training course being set up in Ayn Issa; their purpose is to provide law and order in the areas captured from ISIL during the campaign. As native police, the RISF is supposed to be expanded to at least 3,000 members. On 20 October, SDF declared that Raqqa and its province will decide its own future "within the framework of a decentralised, federal, democratic Syria". They pledged to protect Raqqa province from external threats and hand over control to a civil council from the city. In a ceremony on the same day, SDF handed over administration of Raqqa city to the civil council while the 3,000-strong United States-trained police force was tasked with governance and security. Food, goods and resources have become rare in Raqqa due to clashes, while lives are also at risk from fightings and coalition's bombings. Also, a number of IDP camps and settlement have been set up across northern Syria. On 25 March 2018, protests erupted in Mansoura after a leader of the Bukahmis tribe was arrested by the SDF. Protesters burned tires, and SDF fighters opened fire. The tribal leader was released on the same day. Following the protests, a SDF YPG intelligence officer was killed and his body was dumped on a road near Mansoura. It is unclear if his assassination was related to the protests.. After the conclusion of the campaign, the SDF was faced with a continued insurgency by ISIL. Refugees return to their hometown of Al-Hisbah, after the SDF captured it from ISIL. Fighters of the Tell Abyad Revolutionaries Brigade and the YPG warm themselves at a campfire. A Kurdish fighter fits a SDF flag on a Guardian armored personnel carrier supplied by the US. An anarchist fighters from IRPGF in the suburbs of Raqqa, 21 July 2017. ^ Most leftist foreign volunteers fight as part of the YPG, though some have also formed independent units, such as the Antifascist International Tabur and the IRPGF, or joined the International Freedom Battalion. The latter is a larger unit, mostly composed of Kurdish and Turkish communists. Wikimedia Commons has media related to Raqqa offensive (2016–17). ^ a b J.O (5 February 2017). "Self-defense fighters join Wrath of Euphrates". Hawar News Agency. ^ Harp (2017), pp. 43-49. ^ Deniz, Sinan (13 November 2016). "'Raqqa's fall will bring the end of Erdoğan'". ANF News. Retrieved 26 January 2017. ^ Kajjo, Sirwan (21 December 2016). "Kurdish-Arab Forces in Syria Make Gains in Raqqa Province". Voice of America. ^ Swinford, Steven (25 December 2016). "Operation Raqqa: British RAF pilots to switch bombing raids to 'the heart' of Isil". The Daily Telegraph. Retrieved 16 January 2017. ^ Volkmar Kabisch; Reiko Pinkert (29 March 2017). "Zivile Opfer in Syrien. Bundeswehr in verheerenden Luftschlag involviert". Tagesschau (Germany) (in German). Retrieved 29 March 2017. ^ a b "Did Kurdistan's Counter-Terrorist Group assault the Tabqa Dam in Syria? - SOFREP". 23 March 2017. ^ a b "Syrian army advances west of Raqqa: Hezbollah military media unit". Reuters. 13 June 2017. Retrieved 13 June 2017. ^ a b c Mamo, Hozan (18 February 2017). "Russia bombs ISIS positions in Raqqa". ARA News. Archived from the original on 19 February 2017. Retrieved 18 February 2017. ^ a b "Wrath of Euphrates progressing, 110 villages liberated till now". Hawar News Agency. 1 January 2017. Retrieved 1 January 2017. ^ a b Angus McDowall; Suleiman Al-Khalidi (26 March 2017). "U.S.-backed forces capture Islamic State-held airport near Euphrates dam". Reuters. Retrieved 26 March 2017. ^ a b Issa, Philip (26 March 2017). "US-backed Forces Capture Syrian Air Base From IS". The Associated Press. Bloomberg L.P. Retrieved 26 March 2017. ^ a b "US-backed forces seize Syria's Tabqa, dam from ISIS". Agence-France Presse. Al-Arabiya. Retrieved 10 May 2017. ^ Francis, Ellen (10 May 2017). "U.S.-backed Syria militias say Tabqa, dam captured from Islamic State". Reuters. ^ a b "U.S.-backed Syrian forces seize dam west of Raqqa from Islamic State: SDF". Reuters. 4 June 2017. ^ Antonopoulos, Paul (10 February 2017). "Video: Kurdish-led forces only 5km from the ISIS capital of Raqqa after rapid offensive". ^ "Department of Defense Press Briefing by Col. Dorrian via teleconference from Baghdad, Iraq". U.S. Department of Defense. 15 March 2017. ^ Wladimir van Wilgenburg (18 March 2017). "Kurdish YPG leader says attack on Raqqa city to start in April". ARA News. ^ "SDF commander: The Ayn Issa front advanced to Raqqa by 10km". Hawar News Agency. 6 November 2016. ^ Omar, Enwer (26 December 2016). "Kurdish female fighters playing key role in battle for Raqqa". ARA News. Retrieved 1 January 2017. ^ "Wrath of Euphrates Operations Room, commandant Rojda Felat, Northern Raqqa". YPG. 10 December 2016. Retrieved 1 January 2017. ^ a b c "550 km2 liberated, Wrath of Euphrates reveals outcomes". Hawar News Agency. 14 November 2016. Archived from the original on 14 November 2016. ^ "A military commander" we will besiege gangs on all sides"". Hawar News Agency. 7 November 2016. ^ Haci, Heysem (5 February 2017). "More Arab fighters join Kurdish-led SDF in fight for Raqqa". ARA News. ^ a b "Wrath of Euphrates: campaign successfully advances, 98 villages, hamlets liberated". Hawar News Agency. 12 February 2017. Retrieved 12 February 2017. ^ Correspondent, Barbara Starr, CNN Pentagon. "US aware of recent Baghdadi movements". ^ "Iraqi airstrikes hit ISIS leaders, al-Baghdadi's fate unknown". ARA News. 14 February 2017. ^ a b Kino, Sadredin (27 December 2016). "ISIS commander of Raqqa killed in US airstrike". ARA News. ^ a b c "U.S.-backed force in Syria advances towards IS-held dam". Reuters. 27 December 2016. Retrieved 27 December 2016. ^ a b c Mustafa, Haytham (31 December 2016). "Islamic State replaces Syrian officials by foreign jihadists in Raqqa". ARA News. Archived from the original on 1 January 2017. Retrieved 31 December 2016. ^ "US airstrike kills ISIS propaganda chief in Raqqa". ARA News. Retrieved 7 January 2017. ^ Joscelyn, Thomas (17 November 2016). "US-led coalition killed emir of Islamic State's 'Middle East external networks'". The Long War Journal. Retrieved 17 November 2016. ^ Chew, Amy (15 January 2017). "Three Malaysian ISIS jihadists killed in Raqqa airstrike". Channel NewsAsia. ^ Tabler (2017), pp. 2, 3. ^ a b Tomson, Chris (6 November 2016). "Kurdish forces capture first batch of villages from ISIS in campaign to liberate Raqqa". Retrieved 8 November 2016. ^ "30,000 militants to isolate Raqqa city from its northern countryside". ^ "International coalition: 40,000 fighters prepared to isolate Raqqa". 4 November 2016. ^ a b Omar, Enwer (12 February 2017). "Syrian Democratic Forces seize more ground east Raqqa amid ISIS retreat". ARA News. Retrieved 12 February 2017. ^ "Rebel force targets IS 'capital' Raqqa". Zaman Alwsl. 6 November 2016. ^ "Syrian Arab women battle IS, social stigma". Zaman Alwsl. 10 January 2017. ^ "Syrian rebels announce offensive to retake Raqqa". Al Jazeera. 6 November 2016. ^ a b "3,000 Arab fighters to be deployed under SDF banner for Raqqa battle". Rudaw. 2 February 2017. ^ "The Elite Teams are joining the Wrath of Euphrates". Hawar News Agency. 7 March 2017. ^ "Elite forces withdraw from the fighting fronts with democratic Syrian forces". Al-Etihad Press. 14 April 2017. The source also said that "the leadership of the Elite Forces said earlier that more 3,000 fighters will be involved in the battle to liberate Raqqa, but upon arrival at the Tel Abyad area, it became clear that the number of Elite Forces did not exceed 650 fighters, mostly members of the Shaitat of Deir ez-Zour. ^ "Al-Sanadid Forces join the Operation Wrath of Euphrates". ANF News. 14 November 2016. ^ "Abu Khoula: SDF's advance east of al-Raqqa prepares for Deir ez-Zor liberation". Hawar News Agency. 18 February 2017. Retrieved 12 March 2017. ^ "Shams al-Shamal fighters participating in Wrath of Euphrates". Hawar News Agency. 2 January 2017. Retrieved 2 January 2017. ^ a b Wladimir van Wilgenburg (18 April 2017). "200 fighters from Manbij to join Raqqa operation, SDF gets closer to Tabqa centre". ARA News. Retrieved 18 April 2017. ^ a b "مجلس منبج العسكري سيشارك بـ2200 مقاتل في تحرير الرقة". Manbij FM. 24 May 2017. Retrieved 25 May 2017. ^ "Aylina Kılıç on Twitter". ^ a b "SDF: 2480 square kilometers liberated during Phase II of Raqqa Campaign". YPG Rojava. Retrieved 18 January 2017. ^ "Another group of liberated villages citizens joined SDF". Hawar News Agency. 12 January 2017. ^ "200 more youths from Raqqa join the Operation Wrath of Euphrates". ANF News. 1 April 2017. Retrieved 4 April 2017. ^ a b "US to deploy 200 more troops for Raqqa offensive". Al Jazeera. 10 December 2016. ^ "IS conflict: US sends Marines to support Raqqa assault". 9 March 2017 – via www.bbc.com. ^ a b Dan Lamothe; Thomas Gibbons-Neff (8 March 2017). "Marines have arrived in Syria to fire artillery in the fight for Raqqa". The Washington Post. Retrieved 8 March 2017. ^ Harp (2017), p. 44. ^ "I know Isis fighters. Western bombs falling on Raqqa will fill them with joy". 27 November 2015 – via The Guardian. ^ "The Weekly Review: Sunday 29 November 2015 - Oasis Waterloo Hub". ^ "Most Indian youngsters who joined terror outfit ISIS are based in Raqqa: Report". ^ "3 maps that show why it won't be easy defeating ISIS". ^ a b Seldin, Jeff (27 January 2017). "Islamic State Losing Ground, Still Using Key Supply Routes". Voice of America. ^ "In the first response from the leadership to "the Military Amir of Raqqa", about 200 Syrian fighters arrive from Iraq to Raqqa". SOHR. 25 November 2016. ^ "SDF fighters liberated children exploited by ISIS". Hawar News Agency. 18 January 2017. ^ Antonopoulos, Paul (18 January 2017). "Video: Kurdish-led forces capture ISIS child soldiers near Raqqa". al-Masdar News. ^ "Strong clashes in Makmen and Khanez fronts". Hawar News Agency. 7 February 2017. ^ "Top US official calls ISIS a 'pathetic and a lost cause' after mass surrender of militants at Raqqa". 18 October 2017. Retrieved 19 October 2017. ^ "Coalition strikes 'killing civilians by the hundreds' in Raqqa". The New Arab. 25 May 2017. ^ "5,000 displaced since start of Raqqa offensive: SDF". ^ "Over 2,000 civilians flee Raqqa into SDF-held areas". ^ "Raqqa Civilian Council calls for aid for 100,000 IDPs from ISIS-held areas". ARA News. 28 April 2017. ^ "200,000 flee Raqqa ahead of assault by Syrian forces". The New Arab. 2 June 2017. ^ "U.S.-backed forces push back Islamic State in Raqqa campaign - officials". 11 April 2017 – via Reuters. ^ http://www.thearabweekly.com/, The Arab Weekly. "Syria's last battle? Big push on ISIS capital Raqqa gathers momentum". ^ Kajjo, Sirwan. "Kurdish-Arab Forces in Syria Make Gains in Raqqa Province". ^ "Allies Resist US Plan to Attack Raqqa". Voice of America. 28 October 2016. ^ "Raqqa Fight Starting 'Soon,' Isolation Operation to Include YPG". Voice of America. 27 October 2016. ^ "Syria's U.S.-backed SDF says no to Turkish role in Raqqa operation". Reuters. 3 November 2016. ^ "Forces push deeper into key IS-held northern town Samachar Today". Samachar Today. 27 September 2016. ^ McKay, Hollie (3 November 2016). "Mass exodus as ISIS fighters, families flee Mosul for Raqqa". ^ "US-backed Syrian forces begin Raqqa offensive". Al-Arabiya. 6 November 2016. ^ "US-backed forces launch bid to capture IS Syria 'capital'". Al Monitor. 6 November 2016. ^ General Command of the Democratic Forces of Syria (SDF) (6 November 2016). "Democratic Forces of Syria launch Operation Wrath of Euphrates to liberate Raqqa". ^ "Statement by Secretary of Defense Ash Carter on Raqqa". U.S. Department of Defense. 6 November 2016. ^ "Kurdish forces capture first batch of villages from ISIS in campaign to liberate Raqqa". Almasdar News. 6 November 2016. ^ "Morale is high among anti-Islamic State fighters marching on Raqqa". MiddleEastEye. 6 November 2016. ^ "Syrian Democratic Forces report first gains in Raqqa operation, capture 11 villages". ARA News. 8 November 2016. ^ Tomson, Chris (11 November 2016). "Syrian Democratic Forces overrun ISIS bastion north of Raqqa". al-Masdar News. Retrieved 12 November 2016. ^ "Continued clashes in Raqqa countryside". SOHR. 12 November 2016. ^ "Continued clashes and SDF advance in 33 villages". SOHR. 14 November 2016. ^ "IS attacks SDF in Raqqa countryside". SOHR. 14 November 2016. ^ Tomson, Chris (16 November 2016). "Kurdish forces capture another village in push towards Raqqa city". al-Masdar News. Retrieved 17 November 2016. ^ "An explosion in Tal Abyad town and clashes in the vicinity of Tal al-Samn". SOHR. 15 November 2016. ^ "YPG sdf us forces New advancement in about 10 areas in the countryside of Raqqa within the operation of isolating the city from its countryside". SOHR. 15 November 2016. ^ "Controlling Tal al-Samn area north of Raqqa raises the number of areas controlled by The Syria Democratic Forces of "Euphrates Wrath" to 47". SOHR. 19 November 2016. ^ "SDF fighters completely liberate Tal Saman". Hawar News Agency. 19 November 2016. ^ a b "Raqqa will mark Islamic State's downfall". Asia Times. 20 November 2016. ^ "The Syria Democratic Forces raise the number of villages and farms controlled to 48, Coalition bombards north of Raqqa". SOHR. 21 November 2016. ^ "School students demonstrate against imposing Kurdish books in Hasakah". SOHR. 21 November 2016. ^ "Continued clashes between IS and SDF in Raqqa". SOHR. 23 November 2016. ^ Tomson, Chris (24 November 2016). "Breaking: US soldier dies due to ISIS booby trap in northern Syria". al-Masdar News. Retrieved 25 November 2016. ^ "U.S. soldier fighting ISIS is killed in northern Syria after stepping on an explosive near Raqqa". ^ "200 ISIS members arrive to Syria's Raqqa: rights group". ^ a b "Violent clashes in the vicinity of Tal Sawwanah area and in the northern countryside of Raqqa". SOHR. 26 November 2016. ^ "IS regained control of water pump/station near Kaltah in north Raqqa countryside following clashes with SDF yesterday". Syria Live Map. 27 November 2016. ^ a b Joscelyn, Thomas (13 December 2016). "Pentagon: 2 Paris attack facilitators killed in US airstrike in Raqqa, Syria". Long War Journal. ^ "US airstrike killed militant linked to Charlie Hebdo attack". Business Standard. 10 December 2016. ^ "Islamic State militant linked to Charlie Hebdo attack could still be alive: Iraq". Reuters. 15 April 2017. ^ "Jihan Ahmad: Second phase of the Raqqa campaign due to start". Hawar News Agency. 27 November 2016. ^ "Five Kurdish fighters killed by ISIS fire north Raqqa". ARA News. 30 November 2016. ^ Kajjo, Sirwan (20 November 2016). "2 Top IS Commanders Reportedly Flee Raqqa". VOA News. ^ "Paris attack planners among 3 ISIS fighters killed in drone strike, Pentagon says". 4 December 2016. ^ "Over 1,000 new fighters join Syrian Democratic Forces in fight for Raqqa". ARA News. 10 December 2016. ^ a b "Syrian Democratic Forces launch second phase of Raqqa Operation". ARA News. 10 December 2016. Archived from the original on 13 December 2016. ^ "Coalition warplanes target the northern countryside again, and the regime forces shell al-Vgeh in the countryside of Daraa after advancement of the factions". SOHR. 10 December 2016. ^ "SDF: Phase 2 of Raqqa campaign begins, sights set on al-Tabqa dam". Rudaw. 10 December 2016. ^ "Wrath of Euphrates liberates 6 villages". Hawar News Agency. 11 December 2016. ^ a b "Kurdish-Arab alliance captures new areas in Raqqa, tells ISIS jihadists: "Surrender or Die"". ARA News. 13 December 2016. ^ "Two villages liberated in al-Raqqa". Hawar News Agency. 12 December 2016. ^ "Ajaj and Safakhir villages freed". Hawar News Agency. 12 December 2016. ^ "SDF advances in 2 villages over IS in Raqqa countryside". ^ "Casualties and injuries in Deir Ezzor city and Syria Democratic Forces advance in the countryside of Raqqa". ^ "Clashes in Deir Ezzor city and new advancement for the Syria Democratic Forces at the northern countryside of Raqqa". ^ "SDF advances in 20 areas in Raqqa countryside". ^ Yakovlev, Ivan (19 December 2016). "Syrian Democratic Forces reach Euphrates, besiege ISIS-held area". al-Masdar News. ^ "Clashes continue in Raqqa countryside between IS and SDF". ^ "Syrian Democratic Forces capture new areas west Raqqa amid ISIS retreat". ARA News. 18 December 2016. ^ "Kurd-led forces press Islamic State near Syria's Raqqa". Reuters. 19 December 2016. ^ "SDF advance in 40 villages in Raqqa countryside". ^ "ISIL launched counter-offensive west to Raqqa and regained several villages: Sayqul(صايقول), Khirbat Al Jahsha(خربة الجحشة), Al Majibina(المجيبنة), Khirbat Al Baqra(خربة البقرة)". Syria Live Map. 19 December 2016. ^ "ISIS attack thwarted, 9 mercenaries killed". Hawar News Agency. 19 December 2016. ^ "Kurdish YPG Forces Liberate 54 Villages From ISIS In Province Of Raqqa". South Front. 20 December 2016. ^ a b c "YPG FORCES SEIZE JABAR, DEPLOY CLOSER TO AL-TABQA DAM". South Front. 21 December 2016. ^ "US-backed Syrian Democratic Forces expel ISIS from 97 villages west Raqqa". ARA News. 21 December 2016. ^ a b c Shiwesh, Ahmed (27 December 2016). "Kurdish-led SDF forces expel ISIS from key town west Raqqa, kill over 50 jihadists". ARA News. Retrieved 27 December 2016. ^ "KURDISH YPG SEIZES 3 MORE VILLAGES IN RAQQA PROVINCE, ADVANCING TOWARDS TABQA DAMN". South Front. 21 December 2016. ^ "Warplanes raid on Deir Ezzor and its western countryside and clashes continue in the western countryside of Raqqa". ^ "SDF Kurds have captured Jabah, Bir Shallal and Ghadban, but were pushed back by IS at Jabar in West Raqqa governate". Sytia Live Map. 22 December 2016. ^ "Kurdish YPG forces capture Suwaydiya Saghirah in Syria's Raqqa province (map, video)". South Front. 23 December 2016. ^ "SDF captured Jedi, Jabar villages and control Suwaydiya Saghirah. West Raqqa". Syria Live Map. 23 December 2016. ^ "Wrath of Euphrates: 16 ISIS militants killed in heavy clashes". Hawar News Agency. 23 December 2016. ^ "IS detonates 3 suicide cars in Raqqa countryside". SOHR. 23 December 2016. ^ "Raqqa Campaign: Seven bomb-laden vehicles destroyed". Hawar News Agency. 23 December 2016. ^ "The Syria Democratic Forces advance in the northern banks of the Euphrates River". SOHR. 24 December 2016. ^ "At least 16 ISIS militants killed by SDF fire near Raqqa". ARA News. 24 December 2016. Retrieved 24 December 2016. ^ "Two more villages liberated in Raqqa following heavy clashes". ANF News. 24 December 2016. ^ "SDF 5km from strategic Tabqa dam west of Raqqa". Rudaw. 25 December 2016. ^ "The Syria Democratic Forces and US Special Forces are 5 km away from the Euphrates Dam, kill 25 members of the "Islamic State" at least". SOHR. 25 December 2016. ^ "38 ISIS members killed amid severe clashes in Jabar and Hadaj villages". ANF News. 27 December 2016. ^ "Indian national killed in Syria while fighting for ISIS". al-Masdar News. 28 December 2016. ^ Antonopoulos, Paul (27 December 2016). "ISIS attacks Kurdish positions south of Kobani". al-Masdar News. ^ "A village liberated and 38 mercenaries killed". Hawar News Agency. 28 December 2016. ^ "Coalition strike kills senior ISIS leader in Syria: US". The Daily Star. 6 January 2017. ^ J.O (1 January 2017). "Wrath of Euphrates advances 6 km towards Til Samin". Hawar News Agency. Retrieved 1 January 2017. ^ "Syria Democratic Forces advance in the countryside of al-Tabaqa within "Euphrates Wrath" operation". ^ "Kurdish-led SDF announces liberation of 110 villages, death of 277 ISIS militants in fresh operations near Raqqa". ARA News. 1 January 2017. Retrieved 2 January 2017. ^ "Another strategic step in the Operation Wrath of Euphrates". ANF News. 1 January 2017. Retrieved 1 January 2017. ^ "SDF fighters liberate three more Raqqa villages". Hawar News Agency. 3 January 2017. Retrieved 3 January 2017. ^ "Report: On Ayn Issa front SDF captured Nediye village from ISIL". Syria Live Map. 3 January 2017. Retrieved 3 January 2017. ^ "On Ayn Issa front SDF recaptured Mayan village from ISIL". Syria Live Map. 3 January 2017. Retrieved 3 January 2017. ^ Shiwesh, Ahmed (4 January 2017). "Syrian Democratic Forces seize more ground west Raqqa, push to ISIS capital". ARA News. Retrieved 4 January 2017. ^ "Ain Issa front: SDF captured villages Erbo, Dehlan, Arir, Swwillam, Khirbi Shekh Jiddi". Syria Live Map. 4 January 2017. Retrieved 5 January 2017. ^ Kajjo, Sirwan (3 January 2017). "IS Tightens Internet Restrictions in Raqqa". Voice of America. Retrieved 4 January 2017. ^ "Two villages and two hamlets liberated". Hawar News Agency. 5 January 2017. Retrieved 6 January 2017. ^ "US-backed Kurdish Forces Capture Historic Castle From IS Near Raqqa". Voice of America. 10 January 2017. Retrieved 23 January 2017. ^ Kajjo, Sirwan (6 January 2017). "US-backed Forces in Syria Target Strategic IS-held Dam". Voice of America. Retrieved 6 January 2017. ^ "Kurdish-Arab forces seize strategic Syria citadel from IS". Agnce France-Presse. Yahoo! News. 6 January 2017. Retrieved 6 January 2017. ^ "IS moves prisoners as forces advance on Raqqa". Business Standard. 6 January 2017. Retrieved 6 January 2017. ^ "Eight villages, five hamlets liberated in Raqqa". Hawar News Agency. 6 January 2017. Retrieved 6 January 2017. ^ "Helicopters bomb Morek and continuous clashes in the countryside Ain Issa and the Syria Democratic Forces advance in the area". ^ "ISIS strategic stronghold was liberated". Hawar News Agency. 6 January 2017. Retrieved 6 January 2017. ^ "The Syria Democratic Forces and US Special forces control a village north of al-Tabaqa and reach the outskirts of the strategic Dam of Euphrates". ^ "Violent clashes in several areas near the Euphrates dam in the northern countryside of Raqqa". ^ "Although the arrival of Turkish reinforcements to al-Bab and the "Euphrates Wrath" to the outskirts of Euphrates Dam… the "Islamic State" pulls more than 150 of its members towards the "Euphrates State"". ^ a b "US special forces carry out secret ground raid against Isil in Syria, 'killing at least 25 jihadists'". ^ "SDF fighters liberate one village, three hamlets in Raqqa campaign". Hawar News Agency. 9 January 2017. Retrieved 10 January 2017. ^ "The "Islamic State" renews the counterattacks at the northern banks of Euphrates River". SOHR. 10 January 2017. Retrieved 11 January 2017. ^ Adra, Zen (10 January 2017). "Isis fights back US-backed fighters in northern Syria, captures historical castle". al-Masdar News. Retrieved 11 January 2017. ^ Fadel, Leith (10 January 2017). "[Graphic 18+] ISIS claims to have killed 70+ Kurdish fighters in west Raqqa". al-Masdar News. Retrieved 11 January 2017. ^ "Raqqa offensive: Flood fears as SDF forces near Islamic State-held dam". Middle East Eye. 12 January 2017. Retrieved 12 January 2017. ^ "Third phase of Raqqa campaign announced". Rudaw. 4 February 2017. Retrieved 14 February 2017. ^ "ISIS attack repelled, 6 hamlets liberated". Hawar News Agency. 11 January 2017. Retrieved 11 January 2017. ^ "Two SDF fronts meet northwest of Raqqa, continue push for city". Rudaw. 11 January 2017. Retrieved 12 January 2017. ^ "التقاء المحورين يمهّد لتحرير الطبقة" (in Arabic). Hawar News Agency. 12 January 2017. Retrieved 13 January 2017. ^ "45 villages, 20 hamlets liberated in Raqqa campaign". Hawar News Agency. 13 January 2017. Retrieved 13 January 2017. ^ "SDF fighters liberate Odyan village in Raqqa campaign". Hawar News Agency. 14 January 2017. Retrieved 14 January 2017. ^ "Clashes in several areas in the countryside of Raqqa and aerial bombing on the countryside of Hama". ^ "The "Islamic State" organization is trying to regain areas they lost within the "Euphrates Wrath" operations". SOHR. 15 January 2017. Retrieved 15 January 2017. ^ "ISIS attack thwarted in al-Raqqa". Hawar News Agency. 15 January 2017. Retrieved 15 January 2017. ^ "Syria Democratic Forces advance in the countryside of Raqqa and continuous clashes in several areas". SOHR. 15 January 2017. Retrieved 15 January 2017. ^ "قصف جوي يستهدف الباب واشتباكات عند الضفاف الشمالية لنهر الفرات" (in Arabic). SOHR. 15 January 2017. Retrieved 17 January 2017. ^ "Raqqa tribes declare support for SDF - ANHA". ^ "Afarin Mamosta on Twitter". ^ "Violent clashes in the northern countryside of al-Tabaqa and shells target al-Fu'aa". SOHR. 17 January 2017. Retrieved 17 January 2017. ^ "Kurdish-led SDF repel aggressive ISIS attack". Rudaw. 17 January 2017. Retrieved 20 January 2017. ^ Haci, Siber (20 January 2017). "ISIS attacks YPG security centre west Raqqa, scores of Kurdish fighters killed". ARA News. Archived from the original on 10 October 2017. Retrieved 20 January 2017. ^ Antonopoulos, Paul (19 January 2017). "ISIS attacks YPG security center near Raqqa, many casualties reported". al-Masdar News. Retrieved 20 January 2017. ^ "The Syria Democratic Forces achieve a new advancement in the countryside of Raqqa and shelling renewed on the Eastern Ghouta". SOHR. 20 January 2017. Retrieved 20 January 2017. ^ "SDF forces expel ISIS from strategic town near Raqqa, advance towards Tabqa Dam". ARA News. 23 January 2017. Archived from the original on 25 January 2017. ^ "The Syria Democratic Forces and US Special Forces are making a significant advancement towards the Euphrates Dam and near it, and seek to secure their way towards it". SOHR. 22 January 2017. ^ Mohammad Abdulssattar Ibrahim; Tariq Adely (23 January 2017). "'If the Euphrates River rises any more, it will submerge huge swathes of agricultural land': Islamic State opens turbines of Syria's largest dam". SYRIA:direct. ^ a b c Sjoholm, John (8 February 2017). "Trump's Middle Eastern War, A Bay of Pigs in the making". Lima Charlie. Retrieved 8 March 2017. ^ "7 SDF fighters were killed in battles at the western and northern countryside of Raqqa". SOHR. 24 January 2017. Retrieved 26 January 2017. ^ "Casualties in violent counter attacks in the western countryside of Raqqa". SOHR. 25 January 2017. Retrieved 26 January 2017. ^ "Clashes continue in Raqqa and Aerial bombardment targets Der-Ezzor". SOHR. 26 January 2017. Retrieved 26 January 2017. ^ "IS advances in Tabaqa countryside". SOHR. 25 January 2017. Retrieved 26 January 2017. ^ "SDF fighters seize ammunition amid foiling attacks". Hawar News Agency. 25 January 2017. Retrieved 26 January 2017. ^ "Kurd-led Syrian militia says Trump sent it armoured vehicles". Middle East Eye. 31 January 2017. ^ "Intense raids target bridges in Raqqa and information about cutting off the water of the "Islamic State" organization's stronghold in Syria". SOHR. 3 February 2017. Retrieved 4 February 2017. ^ "Raqqa water supply restored after air strike". Zaman al Wasl. 3 February 2017. Retrieved 4 February 2017. ^ D.H. (3 February 2017). "Coalition warplanes target areas of Raqqa Countryside". Hawar News Agency. Retrieved 4 February 2017. ^ "251 fighters join the SDF ranks after training". Hawar News Agency. 3 February 2017. ^ "Wrath of Euphrates declares 3rd stage of al-Raqqa liberation". Hawar News Agency. 4 February 2017. Retrieved 4 February 2017. ^ "SDF make advance northeast of Raqqa, airstrikes destroy bridges south of the city". Rudaw. 4 February 2017. Retrieved 5 February 2017. ^ "Wrath of Euphrates advancing 19 km, 2 villages and a hamlet liberated". Hawar News Agency. 5 February 2017. Retrieved 5 February 2017. ^ "Fighting operations of "Euphrates Wrath" continue in the northeastern countryside of Raqqa and more advancement for the Syria Democratic Forces". ^ "US coalition jets blast IS-held Syrian town near Euphrates dam". Middle East Eye. 5 February 2017. Retrieved 7 February 2017. ^ "Wrath of Euphrates: a village liberated, dozens of ISIS killed". Hawar News Agency. 6 February 2017. Retrieved 6 February 2017. ^ "نحو 10 قتلى خلال تقدم قوات سوريا الديمقراطية في ريف الرقة الشمالي الشرقي" (in Arabic). SOHR. 6 February 2017. Retrieved 6 February 2017. ^ J.O. (7 February 2017). "Mishrafa village liberated after violent clashes". Hawar News Agency. Retrieved 7 February 2017. ^ D.H. (7 February 2017). "Strong clashes in Makmen and Khanez fronts". Hawar News Agency. Retrieved 7 February 2017. ^ "ملخص الرقة اليومي 7-2-2017" (in Arabic). Step News Agency. 7 February 2017. Retrieved 7 February 2017. ^ "The Campaign to Retake Raqqa Is Accelerating". ^ "Clashes continue in Raqqa countryside between SDF and IS". SOHR. 7 February 2017. Retrieved 6 February 2017. ^ J.O. (9 February 2017). "ISIS attacks foiled on northeast of al-Tabqa Dam". Hawar News Agency. Retrieved 9 February 2017. ^ J.O. (9 February 2017). "Al-Raqqa is encircled from 3 axes by Wrath of Euphrates". Hawar News Agency. Retrieved 9 February 2017. ^ "SDF forces make new gains north of Raqqa as ISIS retreats: spokeswoman". Zaman al-Wasl. 8 February 2017. Retrieved 9 February 2017. ^ D.H. (8 February 2017). "Wrath of Euphrates is 11km away from al-Raqqa". Hawar News Agency. Retrieved 9 February 2017. ^ "Raqqa campaign: Sninh village liberated". Hawar News Agency. 9 February 2017. Retrieved 9 February 2017. ^ ""قسد" تسيطر على قرية جديدة شرق الرقة" (in Arabic). ARA News. 9 February 2017. Retrieved 9 February 2017. ^ "قوات سوريا الديمقراطية تتقدم ضمن المرحلة الثالثة من عملية "غضب الفرات"" (in Arabic). Syrian Observatory for Human Rights. 10 February 2017. Retrieved 11 February 2017. ^ "Mulihan and Badraniye villages liberation - ANHA". ^ "Raqqa campaign: Khaniz and Makman fronts meet". Hawar News Agency. 11 February 2017. Archived from the original on 13 February 2017. Retrieved 11 February 2017. ^ "Airstrikes targets Raqqa countryside with attempts to reduce the advancement distance towards Raqqa city". SOHR. 12 February 2017. Retrieved 12 February 2017. ^ "Violent attacks by the "Islamic State" organization at the Euphrates banks in the northern countryside of al-Tabaqa result in its advance at the expense of Syria Democratic Forces". SOHR. 13 February 2017. Retrieved 13 February 2017. ^ Fadel, Leith (13 February 2017). "ISIS launches massive counter-offensive in western Raqqa". al-Masdar News. Retrieved 13 February 2017. ^ "ISIS attacks US-backed forces, regains village west of Raqqah - Reports". South Front. 13 February 2017. Retrieved 13 February 2017. ^ "The "Islamic State" organization carries out a counter attack northeast Al-Raqqah city to keep forces of "Euphrates Wrath" away of its stronghold in Syria". SOHR. 13 February 2017. Retrieved 14 February 2017. ^ "The "Islamic State" organization attacks sites of the Syria Democratic Forces in the countryside of Al-Hasakah and fighting continues in the countryside of Al-Raqqah". SOHR. 16 February 2017. Retrieved 17 February 2017. ^ "Second step of Operation Wrath of Euphrates launched in third phase". ANHA. 17 February 2017. Retrieved 17 February 2017. ^ "Kurdish forces overrun two ISIS-held villages north of Deir Ezzor". Al-Masdar News. 17 February 2017. Retrieved 17 February 2017. ^ "Joyce village liberated, a bomb-laden vehicle destroyed". Hawar News Agency. 18 February 2017. Retrieved 18 February 2017. ^ "Operation Wrath of Euphates fighters liberate Şiwêhan village". Hawar News Agency. 18 February 2017. Retrieved 18 February 2017. ^ Tomson, Chris (2017-02-18). "Kurdish forces liberate prison on the outskirts of Raqqa city". al-Masdar News. Retrieved 2017-02-19. ^ Tomson, Chris (2017-02-18). "US Airforce propels the Syrian Democratic Forces to capture three villages from ISIS". Al-Masdar News. Retrieved 2017-02-19. ^ "US-backed forces seize 5 more villages from ISIS". South Front. 2017-02-19. Retrieved 2017-02-19. ^ "Wrath of Euphrates:2 villages were liberated, 20 km advanced forward". Hawar News Agency. 2017-02-20. Retrieved 2017-02-20. ^ "Makman-al-Raqqa road was cut and a new village liberated". Hawar News Agency. 2017-02-20. Retrieved 2017-02-20. ^ "Operation Wrath of Euphrates: Fighters liberate base station". Hawar News Agency. 2017-02-20. Retrieved 2017-02-20. ^ "Operation Wrath of Euphates: Terfawî village liberated". Hawar News Agency. 2017-02-20. Retrieved 2017-02-20. ^ "Violent clashes in Al-Raqqah countryside lead to new advancement for Syria Democratic Forces". SOHR. 20 February 2017. Retrieved 28 February 2017. ^ "Warplanes carried out a massacre in the stronghold of the "Islamic State" organization and the Syria Democratic Forces continue advancing in the eastern countryside of Al-Raqqah". SOHR. 20 February 2017. Retrieved 28 February 2017. ^ "Bîr Adman village liberated". Hawar News Agency. 2017-02-20. Retrieved 2017-02-20. ^ "Operation Wrath of Euphrates: Quwaytar village liberated". Hawar News Agency. 2017-02-21. Retrieved 2017-02-21. ^ "Abu Wahi village liberated in Raqqa campaign". Hawar News Agency. 2017-02-21. Retrieved 2017-02-21. ^ "Heavy clashes in Big Siwêdiya village". ANHA. 2017-02-20. Retrieved 2017-02-20. ^ "Wrath of Euphrates progresses, the two wings would meet". Hawar News Agency. 2017-02-22. Retrieved 2017-02-22. ^ "Wrath of Euphrates: two other villages liberated". Hawar News Agency. 2017-02-22. Retrieved 2017-02-22. ^ "YPJ commander: Our forces cut the road to Raqqa and Deir ez-Zor". Hawar News Agency. 2017-02-22. Retrieved 2017-02-22. ^ "US-backed alliance enters Deir Az Zor province". Al-Jazeera. 2017-02-22. Retrieved 2017-02-22. ^ "Three more villages liberated in the Raqqa campaign". Hawar News Agency. 2017-02-23. Retrieved 2017-02-23. ^ "Operation Wrath of Euphrates: four villages liberated". Hawar News Agency. 2017-02-24. Retrieved 2017-02-24. ^ "SDF fighters liberate 3 more villages in Wrath of Euphrates". Hawar News Agency. 2017-02-24. Retrieved 2017-02-24. ^ "The Syria Democratic Forces advance in the outskirts of Deir Ezzor province to close the road between them and the stronghold of the "Islamic State" organization in Al-Raqqah". SOHR. 2017-02-24. Retrieved 2017-02-24. ^ "The 4th axis advances 28 Km, 3 villages were liberated". Hawar News Agency. 2017-02-25. Retrieved 2017-02-25. ^ a b Adra, Zen (26 February 2017). "Coalition airstrikes endanger Tabqa dam in northern Syria". al-Masdar News. Retrieved 28 February 2017. ^ Tomson, Chris (27 February 2017). "Thousands of Kurdish troops arrive from Iraq to spearhead Deir Ezzor offensive". ^ Antonopoulos, Paul (28 February 2017). "US-led coalition airstrikes completely destroy Al-Tabqa airbase in Raqqa". al-Masdar News. Retrieved 28 February 2017. ^ Daniels, Jeff (27 February 2017). "Pentagon delivers plan to speed up fight against ISIS, possibly boosting US troops in Syria". ^ "Operation Wrath of Euphrates: Six villages liberated". Hawar News. 5 March 2017. Retrieved 5 March 2017. ^ "US-backed Syrian Forces Resume Offensive to Recapture Raqqa". Voice of America. 6 March 2017. Retrieved 6 March 2017. ^ Tomson, Chris (6 March 2017). "Kurdish forces capture 15 hamlets in desert area east of Raqqa". ^ Antonopoulos, Paul (6 March 2017). "Kurdish-led forces continue rapid progress in rural Raqqa against ISIS". ^ Kajjo, Sirwan (6 March 2017). "US-backed Syrian Forces Cut Key Road Linking Raqqa, Deir Ezzor". Voice of America. Retrieved 6 March 2017. ^ Perry, Tom (6 March 2017). "U.S.-backed Syrian force cuts last road out of IS stronghold". Reuters. Retrieved 6 March 2017. ^ Tony Gamal-Gabriel; Ammar Khan (7 March 2017). "Iraqi forces retake government HQ, museum in Mosul". Agence-France Presse. Yahoo! News. Retrieved 7 March 2017. ^ Yaqoub, Mir (7 March 2017). "Syrian Democratic Forces seize more ground eastern Raqqa amidst ISIS decline". ARA News. Retrieved 7 March 2017. ^ Tomson, Chris (6 March 2017). "Kurdish forces seize military base from ISIS amid massive offensive in Deir Ezzor". Al-Masdar News. Retrieved 7 March 2017. ^ "Strategic hill liberated in Operation Wrath of Euphrates". Hawar News Agency. 8 March 2017. Retrieved 8 March 2017. ^ "About 150 militants in IS reach Raqqa city after a strict siege by SDF". SOHR. 8 March 2017. Retrieved 8 March 2017. ^ "Strategic East Menxer Hill liberated in Raqqa campaign". Hawar News Agency. 9 March 2017. Retrieved 9 March 2017. ^ "Two villages liberated in Operation Wrath of Euphrates". Hawar News Agency. 9 March 2017. Retrieved 9 March 2017. ^ "Operation Wrath of Euphrates: Jezera village liberated". Hawar News Agency. 9 March 2017. Retrieved 9 March 2017. ^ "244 Arab youths graduate and join SDF ranks". Hawar News Agency. 9 March 2017. Retrieved 26 March 2017. ^ "Operation Wrath of Euphrates liberates two villages". Hawar News Agency. 10 March 2017. Retrieved 10 March 2017. ^ a b "The Syria Democratic Forces advance in 2 villages in the eastern countryside of Al-Raqqah". SOHR. 10 March 2017. Retrieved 10 March 2017. ^ Tomson, Chris (10 March 2017). "Kurdish militants slice through the Islamic State heartland near Raqqa". ^ "Wrath of Euphrates: Kas Ajeyl village liberated". Hawar News Agency. 12 March 2017. Retrieved 12 March 2017. ^ "Continued clashes in the eastern countryside of al-Raqqah city within the "Euphrates Wrath" operations". SOHR. 12 March 2017. Retrieved 15 March 2017. ^ a b "Violent clashes in the vicinity of the towns of Al-Fu'ah and Kafriya in the countryside of Idlib and the "Islamic State" organization continues its attempt to recover what it lost east of Al-Raqqah". SOHR. 13 March 2017. Retrieved 9 March 2017. ^ Charkatli, Izat (11 March 2017). "Hundreds of ISIS fighters pour into Raqqa as Kurdish forces advance". ^ "US-backed Kurdish-led forces advance against ISIS along Euphrates east of Raqqah". South Front. 14 March 2017. Retrieved 15 March 2017. ^ Fadel, Leith (14 March 2017). "Kurdish forces on the brink of cutting ISIL's main supply line from Raqqa to Deir Ezzor". Al-Masdar News. Retrieved 15 March 2017. ^ "Wrath of Euphrates spokeswoman: Raqqa is now isolated". Al-monitor. 15 March 2017. Retrieved 16 March 2017. ^ "Wrath of Euphrates: making 5 km progress, Hamad Asaf silos liberated". Hawar News. 16 March 2017. Retrieved 16 March 2017. ^ "US-backed Syrian Democratic Forces captured two villages east of Raqqah". South Front. 16 March 2017. Retrieved 16 March 2017. ^ Tomson, Chris (16 March 2017). "Kurdish forces renew push towards Raqqa city, two villages liberated from ISIS". Al-Masdar News. Retrieved 16 March 2017. ^ "Exclusive: Syrian Kurdish YPG says Raqqa attack to start in early April". 17 March 2017 – via Reuters. ^ "Violent clashes around Khas Ageyl village". Hawar News. 18 March 2017. Retrieved 19 March 2017. ^ "Clashes continue between IS and SDF in Raqqa and Hasakah". SOHR. 18 March 2017. Retrieved 19 March 2017. ^ "A big part of al-Karama town is liberated". Hawar News. 19 March 2017. Retrieved 19 March 2017. ^ "Airstrikes on al-Raqqa's countryside cause more casualties and clashes continue in the east". SOHR. 19 March 2017. Retrieved 20 March 2017. ^ "The "Euphrates Wrath" operations continue in the eastern countryside of the capital and SDF advance more". SOHR. 20 March 2017. Retrieved 20 March 2017. ^ "تحرير قرية جرقا التابعة لبلدة الكرامة من مرتزقة داعش" (in Arabic). Hawar News. 20 March 2017. Retrieved 20 March 2017. ^ "Wrath of Euphrates: a train station liberated". Hawar News. 20 March 2017. Retrieved 20 March 2017. ^ "تحرير محطة ضخ مياه المحمدية" (in Arabic). Hawar News. 20 March 2017. Retrieved 20 March 2017. ^ "US-backed Kurdish forces seized Karamah town east of Raqqah". South Front. 20 March 2017. Retrieved 20 March 2017. ^ "Operation Wrath of Euphrates: Hemed Asaf liberated". Hawar News. 22 March 2017. Retrieved 22 March 2017. ^ a b "انفجار مفخخة بريف الحسكة وتواصل المعارك بريف الرقة الشرقي" (in Arabic). SOHR. 22 March 2017. Retrieved 22 March 2017. ^ "Operation Wrath of Euphrates: Cedîdit Mexyet liberated". Hawar News. 22 March 2017. Retrieved 22 March 2017. ^ "IS conflict: Strike on Raqqa school 'kills displaced civilians'". BBC. 22 March 2017. Retrieved 22 March 2017. ^ "SDF liberates Misharfit al-Shihnat village". Hawar News. 23 March 2017. Retrieved 23 March 2017. ^ "Al-Xasansiye village liberated, progress continues". Hawar News. 24 March 2017. Retrieved 24 March 2017. ^ "Syria Democratic Forces advance and control new villages in the eastern countryside of Al-Raqqah". SOHR. 24 March 2017. Retrieved 24 March 2017. ^ "US-Backed Forecs Developing Advance East Of Raqqah". 24 March 2017. ^ "Farsat Abdûlismail village liberated in Wrath of Euphrates". 24 March 2017. Retrieved 24 March 2017. ^ "معارك "غضب الفرات" تتواصل وقوات سوريا الديمقراطية تتقدم على ضفاف الفرات الشمالية" (in Arabic). SOHR. 24 March 2017. Retrieved 24 March 2017. ^ "Kurdish forces supported by US-led coalition capture more villages from ISIS". 24 March 2017. Retrieved 26 March 2017. ^ Barbara Starr; Zachary Cohen; Ryan Browne (22 March 2017). "US joins first air assault 'behind enemy lines' against ISIS in Syria". CNN. Retrieved 22 March 2017. ^ "Coalition airdrops SDF and US forces into Tabqa for joint operation". Rudaw. 22 March 2017. Retrieved 22 March 2017. ^ Sjoholm, John (22 March 2017). "US forces seek to take critical Tabqa dam before ISIS uses it as a weapon of terror". Lima Charlie News. Retrieved 22 March 2017. ^ Gordon, Michael R.; Barnard, Anne (22 March 2017). "U.S. Airlifts Hundreds of Militia Fighters in Attack to Cut Off Raqqa, Syria" – via NYTimes.com. ^ Rogoway, Tyler. "US Backed Forces Take Strategic Syrian Dam To Block ISIS From Escaping Raqqa". ^ "The atrocities against civilians that coincided with London's attack". The New Arab. 23 March 2017. Retrieved 23 March 2017. ^ a b "Siria: Isis perde la diga di Tabqa, strategica per la sua sopravvivenza - Difesa e Sicurezza". 23 March 2017. ^ Antonopoulos, Paul (23 March 2017). "SDF capture Tabqa Dam from ISIS in spectacular behind enemy lines operation". ^ "US Special Forces, SDF capture Tabqa Dam in Raqqah province - Unconfirmed". South Front. 23 March 2017. Retrieved 23 March 2017. ^ "SDF prepares to take Tabqa dam after successful airdrop mission". Rudaw. 23 March 2017. Retrieved 23 March 2017. ^ "U.S.-Backed Syrian Force Expects to Attack Tabqa Soon". Reuters. U.S. News & World Report. 23 March 2017. Retrieved 24 March 2017. ^ "ISIS Reportedly Redeploys Forces From Deir Ezzor To Raqqah". 23 March 2017. ^ Antonopoulos, Paul (24 March 2017). "ISIS denies that Kurdish-led forces captured Tabqa Dam". Reuters. Retrieved 24 March 2017. ^ "DEVELOPING: Joint US offensive to take back Tabqa Dam from ISIS sees gains". Lima Charlie News. 24 March 2017. Retrieved 24 March 2017. ^ "ANF - Ajansa Nûçeyan a Firatê". ^ Tomson, Chris (25 March 2017). "Kurdish forces close in on ISIS controlled Tabqa Airbase amid blitz offensive in Raqqa". ^ "Al-Acel al-Sharqi and al-Gharbi were liberated - ANHA". ^ a b Tomson, Chris (26 March 2017). "BREAKING: Kurdish forces liberate Tabqa Airbase in Raqqa province". Al-Masdar News. Retrieved 26 March 2017. ^ "VICTORY - Mission Tabqa Dam Complete, joint US SpecOps retake vital dam from ISIS - Lima Charlie News". 26 March 2017. ^ Şafak, Yeni. "PYD takes Tabqa Dam in northern Syria: local sources". ^ Francis, Ellen (27 March 2017). "U.S.-backed Syrian militias say have paused military operations near Tabqa dam". Reuters. Retrieved 27 March 2017. ^ McDowall, Angus (27 March 2017). "Syria dam not damaged: SDF Raqqa campaign spokeswoman". Reuters. Retrieved 27 March 2017. ^ "SDF liberates two villages from ISIS west of Raqqa". NRT. 27 March 2017. Retrieved 27 March 2017. ^ "US-backed Fighters to Pause Military Action Near Syria Dam". Voice of America. 27 March 2017. Retrieved 27 March 2017. ^ "Two villages liberated west of al-Raqqa". Hawar News. 27 March 2017. Retrieved 27 March 2017. ^ "US-backed Syria forces resume fighting near Tabqa dam". Al-Jazeera. 28 March 2017. Retrieved 28 March 2017. ^ Said, Rodi (28 March 2017). "Guns silent as engineers work to ease pressure on Syrian dam". Reuters. Retrieved 28 March 2017. ^ Said, Rodi (29 March 2017). "Engineers repair Syria's Tabqa dam spillways after shelling". Reuters. Retrieved 29 March 2017. ^ "US Special Forces and the Syria Democratic Forces continue their operation to complete the siege on al-Tabaqa city". SOHR. 31 March 2017. Retrieved 31 March 2017. ^ "عشيرة العجيل بشيوخها وشبانها تساند قوات سوريا الديمقراطية - ANHA". ^ "Syrian Democratic Force storming Al-Sfsafeh town". South Front. 1 April 2017. Retrieved 1 April 2017. ^ "Leaflets call members of the "Islamic State organization in al-Tabaqa to "surrender" and the clashes renewed east of the city". SOHR. 31 March 2017. Retrieved 1 April 2017. ^ "Continuous violent clash between the Syria Democratic Forces and the "Islamic State" organization in the countryside of al-Tabaqa". SOHR. 1 April 2017. Retrieved 1 April 2017. ^ Adra, Zen (3 April 2017). "US-backed forces clash with ISIS outside Tabqa [Video + Photos]". Al-Masdar News. Retrieved 3 April 2017. ^ a b Tomson, Chris (21 April 2017). "Daring US airborne raid kills military advisor of ISIS leader". Retrieved 23 April 2017. ^ Adra, Zen (9 April 2017). "US-backed fighters foil ISIS attack east of Tabqa". Al-Masdar News. Retrieved 10 April 2017. ^ "Al-Raqqa's 'Ayed al-Kabeer village liberated". ANHA. 10 April 2017. Retrieved 14 April 2017. ^ a b John Davison; Rodi Said (13 April 2017). "U.S.-backed forces launch new attacks on Islamic State in Syria: statement". Reuters. ^ "Syrian Militia Announces 4th Phase of Offensive against IS in al-Raqqa". Latin American Herald Tribune. 13 April 2017. ^ "US-backed Syrian forces set sights on valley north of Raqqa". 13 April 2017. ^ "Syrian Democratic Forces launch latest phase of Raqqa operation". Kom News. 13 April 2017. ^ "About 15 fighters were killed in clashes and explosion of an explosive belt in the countryside of Al-Raqqah and the "Islamic State" organization intensifies its counter attacks and booby trapped vehicles on locations of "Euphrates Wrath" operation". SOHR. 13 April 2017. ^ "Observatory: SDF on Doorstep of Syria's Tabqa". Asharq al-Awsat. 15 April 2017. ^ "قوات سوريا الديمقراطية تدخل ضواحي مدينة الطبقة بعد 24 يوماً من انتقال المعارك إلى ضفة الفرات الجنوبية عقب عملية الإنزال" (in Arabic). SOHR. 15 April 2017. ^ Tomson, Chris (15 April 2017). "ISIS in big trouble as Kurdish troops seize entire neighborhood in Tabqa city". ^ "SDF forces enter Taqba city, 16 ISIS fighters killed - ARA News". 16 April 2017. Archived from the original on 17 May 2017. ^ "27 ISIS members killed in Misharfa village near Tabqa". ANF News. 15 April 2017. ^ "BREAKING: Kurdish forces storm ISIS bastion in western Raqqa". Al-Masdar News. 15 April 2017. ^ Tomson, Chris (17 April 2017). "Kurdish troops capture three villages from ISIS en route to Raqqa city". Retrieved 23 April 2017. ^ "Syria Democratic Forces advance in the 4th phase of their military operation". SOHR. 17 April 2017. ^ "3 villages and 4 hamlets liberated". ANHA. 17 April 2017. ^ "Shams al-Shamal fighters participating in Wrath of Euphrates - ANHA". en.hawarnews.com. Retrieved 10 July 2017. ^ "A rapid progress towards al-Tabqa center made". ANHA. 18 April 2017. ^ Tomson, Chris (18 April 2017). "ISIS fighters trapped in western Raqqa as Kurdish forces seize new sites inside Tabqa". Al-Masdar News. ^ "Al-Hatash village liberated". ANHA. 19 April 2017. ^ "Syrian Democratic Forces advancing in al-Iza'a area in Tabqa". South Front. 19 April 2017. ^ "The Syria Democratic Forces advance in several villages within the 4th stage of operations of "Euphrates Wrath"". SOHR. 19 April 2017. ^ "معارك مستمرة بعنف ضمن استمرار المرحلة الرابعة من عمليات "غضب الفرات" في ريف الرقة" (in Arabic). SOHR. 20 April 2017. ^ "The Syria Democratic Forces achieved a new advancement in the northern countryside of Al-Raqqah and warplanes raid on the countryside of Idlib". SOHR. 20 April 2017. ^ Tomson, Chris (20 April 2017). "10,000 civilians flee Tabqa battle as Kurdish units capture villages north of Raqqa". Al-Masdar News. ^ Tomson, Chris (21 April 2017). "Kurdish pincer offensive cuts off bunch of ISIS-held villages north of Raqqa". Al-Masdar News. ^ "SDF seek to besiege ISIS in villages in the northern countryside of al-Raqqa". SOHR. 21 April 2017. ^ "أكثر من 30 قتيل من تنظيم "الدولة الإسلامية" خلال معارك شمال الرقة وقوات سوريا الديمقراطية تقلص المسافة لأقل من 6 كلم بين محوري تقدمها" (in Arabic). SOHR. 22 April 2017. ^ "Wrath of Euphrates: two towns liberated, 49 mercenaries killed". Hawar News. 22 April 2017. ^ Tomlinson, Lucas (21 April 2017). "ISIS moves its capital in Syria". Retrieved 23 April 2017. ^ a b "Kurdish blitz offensive wrestles control of 13 villages from ISIS in northern Raqqa". Al-Masdar News. 24 April 2017. Retrieved 25 April 2017. ^ Tomson, Chris (25 April 2017). "ISIS loses huge numbers in Tabqa city as Kurdish forces capture second neighborhood". Al-Masdar News. Retrieved 25 April 2017. ^ "After 34 days of moving the clashes to Euphrates' west bank… SDF advance and enter outskirts of al-Tabaqa city". SOHR. 25 April 2017. Retrieved 25 April 2017. ^ "تنظيف دوار العلف وجزيرة المحمية من المرتزقة" (in Arabic). ANHA. 25 April 2017. Retrieved 25 April 2017. ^ "SDF fighters advancing on two fronts meet". ANF News. 25 April 2017. Retrieved 25 April 2017. ^ "At least 311 ISIS jihadists killed by SDF fire in military campaign to liberate Raqqa's northern countryside". ARA News. 25 April 2017. Retrieved 25 April 2017. ^ "U.S.-Backed Forces Push Against IS in Slowed Raqqa Campaign". Reuters. U.S. News. 28 April 2017. Retrieved 28 April 2017. ^ "YPG threatens to withdraw from Raqqa ops amid Turkish attacks". NRT TV. 28 April 2017. Retrieved 28 April 2017. ^ McDowall, Angus (30 April 2017). "U.S.-backed militias claim big advance against IS in Syria's Tabqa". Reuters. Retrieved 30 April 2017. ^ Barrington, Lisa (1 May 2017). "U.S.-backed militias oust Islamic State from Syria's Tabqa old city". Reuters. Retrieved 1 May 2017. ^ "Elite Forces graduated a new batch of fighters to engage in the battle of tenderness". Al-Etihad Press. 3 May 2017. ^ "100 Arab young men joined SDF - ANHA". en.hawarnews.com. Retrieved 10 July 2017. ^ McDowall, Angus (8 May 2017). "U.S.-backed militias say they made new advance against Islamic State in Tabqa". Reuters. Retrieved 10 May 2017. ^ "Watanî Hospital west of Tabqa cleared of ISIS". ANF News. 7 May 2017. Retrieved 10 May 2017. ^ "Connection severed between Tabqa Dam and three neighborhoods". ANF News. 8 May 2017. Retrieved 10 May 2017. ^ Tomson, Chris (8 May 2017). "Kurdish forces slice adrift ISIS pocket in western Raqqa". Al-Masdar News. Retrieved 10 May 2017. ^ "ISIS chief Abu Bakr Al-Baghdadi asks for help in Raqqa". Ahlul Bayt News Agency. 8 May 2017. Retrieved 10 May 2017. ^ "Sahel al-Khashab completely liberated". Hawar News Agency. 8 May 2017. Retrieved 10 May 2017. ^ "After agreeing to withdraw… Foreigner fighters of the "Islamic State" organization refuse to comply and start a guerrilla war in al-Tabaqa city's neighborhoods". SOHR. 8 May 2017. Retrieved 10 May 2017. ^ News, ANF. "Fourth phase of the Wrath of Euphrates relaunched after 15 days". ANF News. ^ "US-backed Syrian forces 'fully capture' Tabqa from ISIL". Al-Jazeera. Retrieved 10 May 2017. ^ "Fourth stage of Operation Wrath of Euphrates is resumed". Hawar News Agency. Retrieved 11 May 2017. ^ Tomson, Chris. "Kurdish forces capture three villages just ten kilometers north of ISIS-held Raqqa". Al-Masdar News. Retrieved 11 May 2017. ^ "Syrian Democratic Forces took full control over Tabqa town and Tabqa Dam". South Front. Retrieved 11 May 2017. ^ Castro, Ivan. "Syrian Democratic Forces inch closer to the self-proclaimed capital of ISIS". Al-Masdar News. Retrieved 12 May 2017. ^ "تحرير قرية خربة خان وإحباط هجوم على أم تنك" (in Arabic). Hawar News. 11 May 2017. ^ "The day after: US-backed forces thwart Islamic State counterattack after Tabqa win". Syria Direct. 12 May 2017. ^ "Syrian Army, Kurdish forces team up against ISIS in rural Aleppo, Raqqa – Map update". Al-Masdar News. 13 May 2017. ^ "Syrian fighters move even closer to ISIL's 'capital'". The National. Associated Press. 13 May 2017. ^ "El-Ensar village liberated from gangs". Hawar News. 12 May 2017. ^ "SDF advances 6 km towards the Raqqa city". ANF. 12 May 2017. ^ "Other 3 villages north of al-Raqqa liberated". Hawar News Agency. 14 May 2017. ^ ""Euphrates Wrath" operation forces continue their offensive for the 3rd consecutive day and advancement in more areas". SOHR. 14 May 2017. ^ "Kurdish forces reach the northern gates of Raqqa after liberating four more villages". Al-Masdar News. 14 May 2017. ^ "U.S.-backed forces capture 3 more villages from ISIS in Northern Raqqa". South Front. 14 May 2017. ^ "Two al-Raqqa's villages, 17 hamlets liberated from gangs". Hawar News Agency. 15 May 2017. ^ "3 villages, 15 hamlets liberated from IS gangs". Hawar News Agency. 16 May 2017. ^ "تحرير قرية الرشيد" (in Arabic). Hawar News. 15 May 2017. ^ "التقدم باتجاه مدينة الرقة يتواصل: تحرير قرية وصوامع القمح". Hawar News Agency. 16 May 2017. ^ "Kurdish forces just three kilometers from Raqqa as ISIS loses control of key highways". Al-Masdar News. 18 May 2017. ^ ""Euphrates Wrath" forces continue their operations to reduce the "Islamic State" organization's controlled areas and to take more villages from it in the eastern countryside of Al-Raqqah". SOHR. 18 May 2017. ^ "Hamrat Ghanam is liberated by SDF". Hawar News. 18 May 2017. ^ "QSD`ê gaveke din nêzî Reqqayê bû, du gundên din hatin rizgarkirin" (in Kurdish). Hawar News Agency. 19 May 2017. ^ "The forces of the " Euphrates Wrath " operation manage to achieve more advances in the eastern countryside of al-Raqqa and documenting the death of their fighters during the battles". SOHR. 19 May 2017. ^ "Al-Raqqa: village liberated, 13 mercenaries killed". Hawar News. 21 May 2017. ^ "Another step towards al-Raqqa". Hawar News. 21 May 2017. ^ "Syrian Democratic Forces deploy closer to ISIS self-proclaimed capital of Raqqah". South Front. 21 May 2017. ^ ""Euphrates Wrath" operation forces advance west of Al-Raqqah and control new village and get closer to Al-Baath Dam". SOHR. 22 May 2017. ^ "2 villages liberated, 21 mercenaries killed". Hawar News. 23 May 2017. ^ "SDF advancing against ISIS in western Raqqah countryside (Map)". South Front. 23 May 2017. ^ "Kurdish forces on the verge of capturing Baath dam amid new gains in rural Raqqa". Al-Masdar News. 24 May 2017. ^ "SDF liberates the Yamamah village in Raqqa operation". ANF. 23 May 2017. ^ "Wrath of Euphrates: a town and village liberated". Hawar News. 24 May 2017. ^ "Syrian Democratic Forces developing advance east and west of Raqqa (Photos, Video)". South Front. 24 May 2017. ^ "A village north of al-Hurriyah Dam liberated". Hawar News. 25 May 2017. ^ "US-backed forces few metres away from Baath Dam in Raqqa (Videos, Photos)". South Front. 25 May 2017. ^ "1,000 young men join SDF". Hawar News. ^ "Kurds reach the gates of Raqqa as 4,000 ISIS fighters gear up for apocalyptic battle". ^ "U.S.-backed forces seize Islamic State-held town near Syria's Raqqa: source, monitor". Reuters. 2 June 2017. ^ "U.S.-backed Syrian force starts battle to capture Raqqa from Islamic State". Reuters. 6 June 2017. ^ "U.S.-backed anti-IS forces to announce Raqqa assault start date on Tuesday". Reuters. 5 June 2017. ^ "ISIS fully encircled in Raqqa city after latest Kurdish advances". 24 June 2017. Retrieved 10 July 2017. ^ "Al-Andalus and al-Matar neighborhoods liberated". Hawar News Agency. 16 October 2017. Retrieved 18 October 2017. ^ "Raqqa's Al Naim roundabout liberated, 37 ISIS members surrender". Hawar News Agency. 16 October 2017. Retrieved 18 October 2017. ^ Luis Martinez; Morgan Winsor (20 October 2017). "US-backed Syrian forces declare victory over ISIS in its former 'capital,' Raqqa". Retrieved 20 October 2017. ^ Fadel, Leith (13 June 2017). "Syrian Army kicks off Raqqa offensive in a big way, key oil field liberated". Al-Masdar News. Retrieved 13 June 2017. ^ Oriana Pawlyk (18 May 2017). "US F/A-18E Shoots Down Syrian Su-22 in Air-to-Air Kill". Military.com. Retrieved 19 June 2017. ^ "A regime warplane was targeted and dropped in the skies of the al-Resafa area". SOHR. 19 May 2017. Retrieved 19 June 2017. ^ "Syrian regime: a fighter downed by global coalition". Hawar News Agency. 19 May 2017. Retrieved 19 June 2017. ^ Al-Khalidi, Suleiman (15 July 2017). "Syrian army takes more oil fields from Islamic State in Raqqa and eastern desert". Reuters. Retrieved 18 July 2017. ^ Tomson, Chris (16 July 2017). "Three gas fields liberated as Syrian Army brushes ISIS aside in southern Raqqa". Al-Masdar News. Retrieved 18 July 2017. ^ "Local civilian council to run post-ISIS Raqqa: Kurdish official". ARA News. 14 November 2016. ^ "US facilitating joint talks with Turkey, Syrian Kurdish forces to ease tension". Hurriyet Daily News. 9 December 2016. ^ "Syria's Raqqa expected to join Kurdish-led federalism: Kurdish leader". Reuters. 27 March 2017. ^ "Al-Raqqa Civil Council undertakes the liberated areas administration". Hawar News Agency. 27 March 2017. ^ Wladimir van Wilgenburg (20 April 2017). "Kurdish feminist appointed as co-head of Raqqa civilian council". ARA News. ^ "Raqqa Civilian Assembly Establishment Meeting kicks off". ANF News. 18 April 2017. ^ "Raqqa to be administered by Civilian Assembly after liberation". ANF News. 18 April 2017. ^ "Al-Raqqa's constituent congress: a statement released, decisions made". Hawar News Agency. 18 April 2017. ^ Francis, Ellen (18 April 2017). "U.S.-allied Syrian groups form civilian council to run Raqqa". Reuters. ^ "US-backed Syria forces set up post-ISIS Raqqa council". Agence-France Presse. Al-Arabiya. 18 April 2017. ^ "Raqqa Civilian Assembly starts works in liberated areas". ANF News. 20 April 2017. ^ News, ANF. "Tabqa Civilian Assembly declared". ANF News. Retrieved 10 July 2017. ^ Wladimir van Wilgenburg (17 May 2017). "US-led coalition trains Raqqa Internal Forces to run post-ISIS city". ARA News. Retrieved 22 May 2017. ^ Tom Perry (20 October 2017). "Raqqa to be part of "federal Syria", U.S.-backed militia says". Reuters. Retrieved 23 October 2017. ^ "Syria's Raqqa handed over to local officials and tribal elders". Associated Press. France24. 20 October 2017. Retrieved 23 October 2017. ^ "Syria's Democratic Militias Release Al-Bukahmis Leader in Raqqa". Syria Call. 26 March 2018. Harp, Seth (23 February 2017). "The Anarchists vs. ISIS". Rolling Stone. New York City: Wenner Media LLC. pp. 42–49. Tabler, Andrew J. (2017). "Eyeing Raqqa: A tale of four tribes" (PDF). Policy Notes. Washington, D.C.: The Washington Institute for Near East Policy (38).